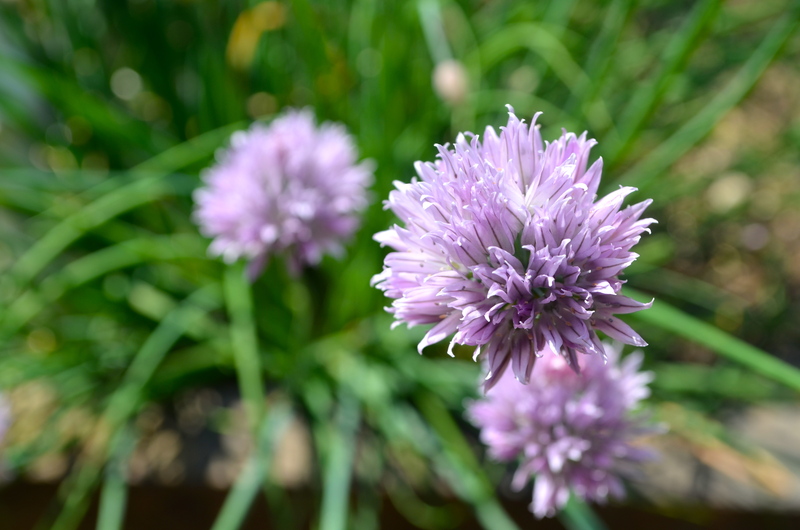 My garden is finally giving me some reward for all the hard work I’ve put into the garden the last few months. 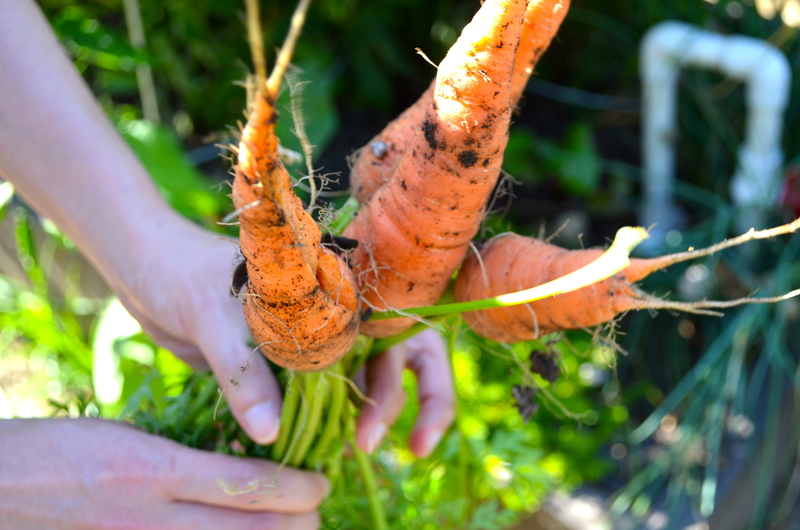 We are beginning to eat more regularly out of the garden. 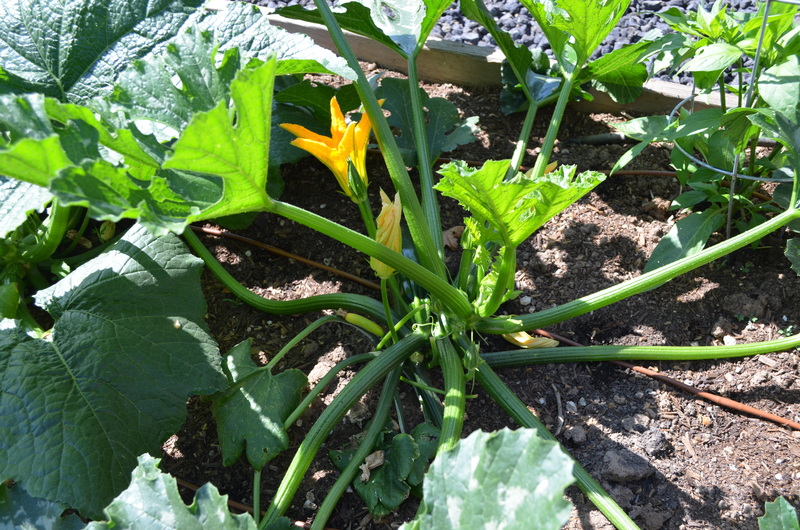 Our first zucchini have come in and I am determined to pick it while it is small and tender. 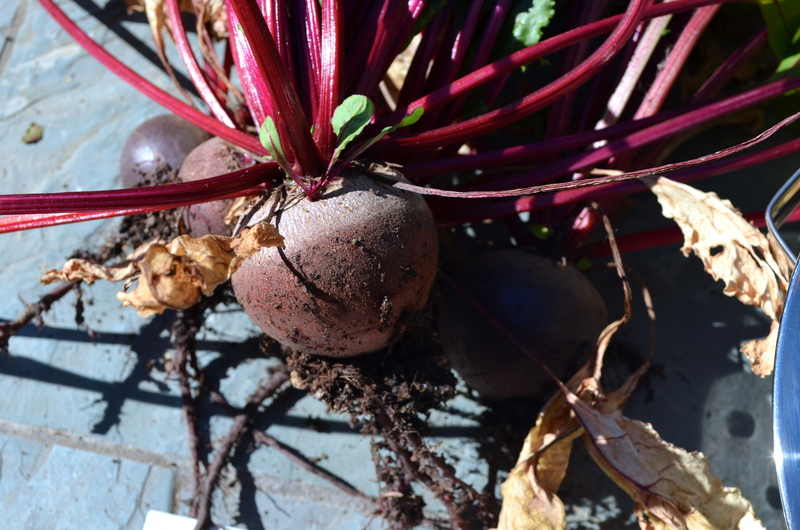 We have been roasting lots of root vegetables like carrots and beets. 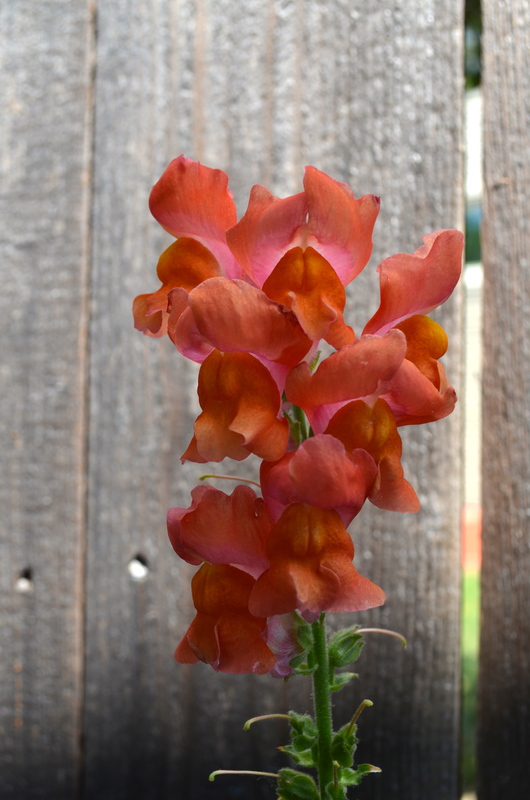 I’m excited for what else my garden has to offer me. 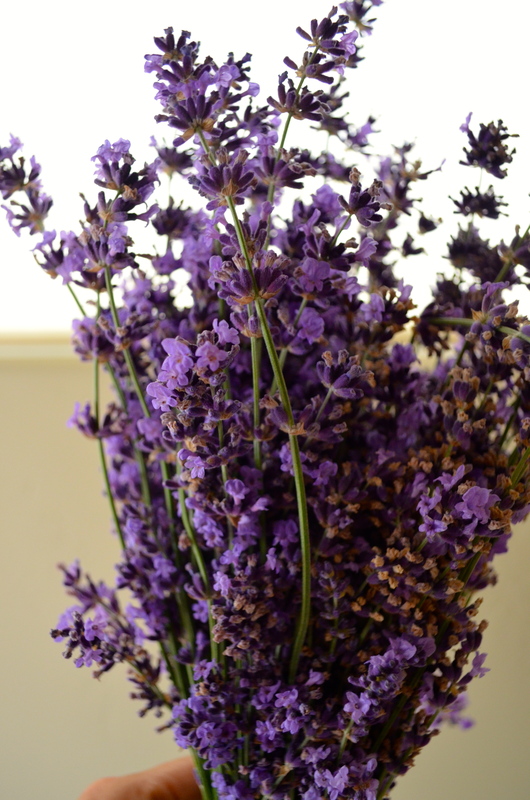 Tags: harvest, June garden | Permalink. 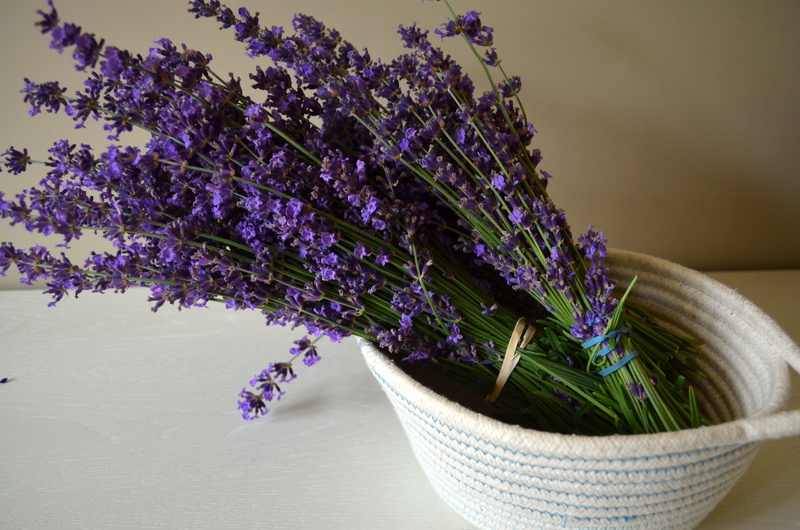 Yesterday I harvested some of my dad’s beautiful lavender (Lavandula angustifolia “Hidcote Blue’). 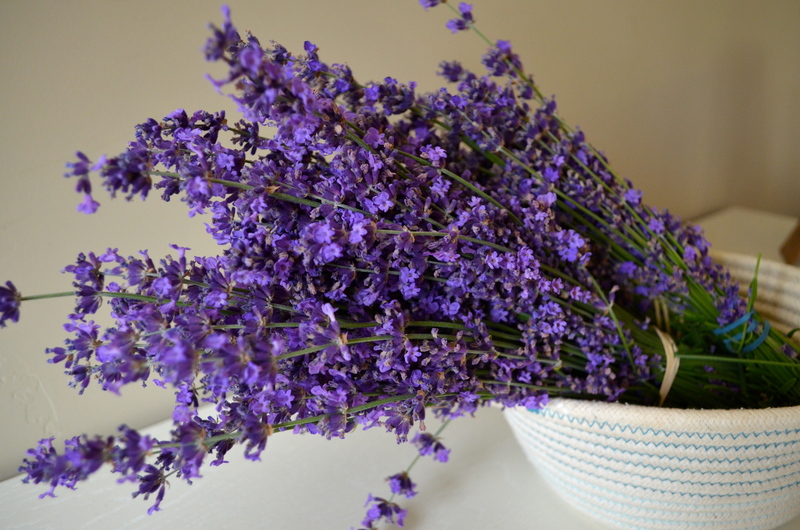 This lavender smells delicious and looks even better this year than last year (click here to see my harvest from last year). 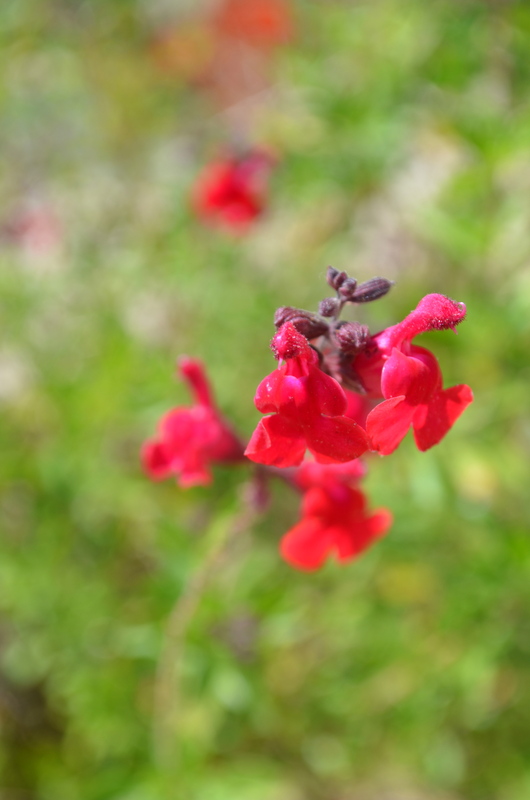 My dad said he cut back the plant pretty aggressively after the blooms were done last season which may account for the overflowing flowers this year. 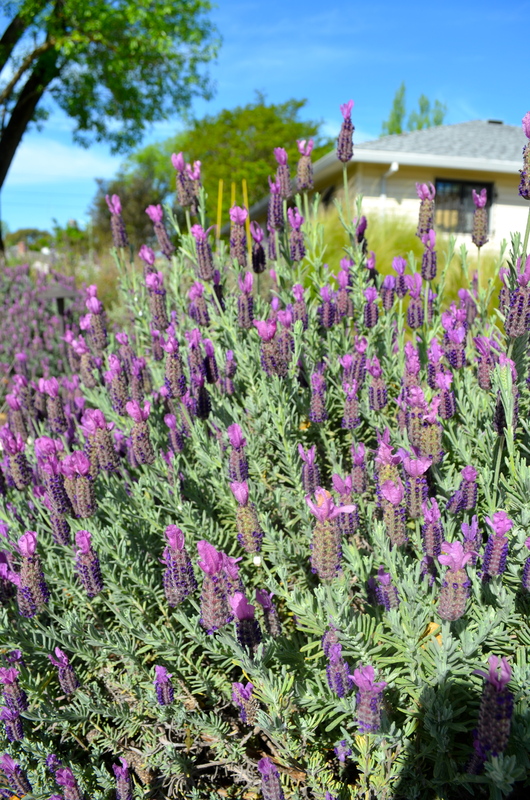 It was a bit challenging harvesting without disturbing the hundreds of honey bees visiting the lavender. 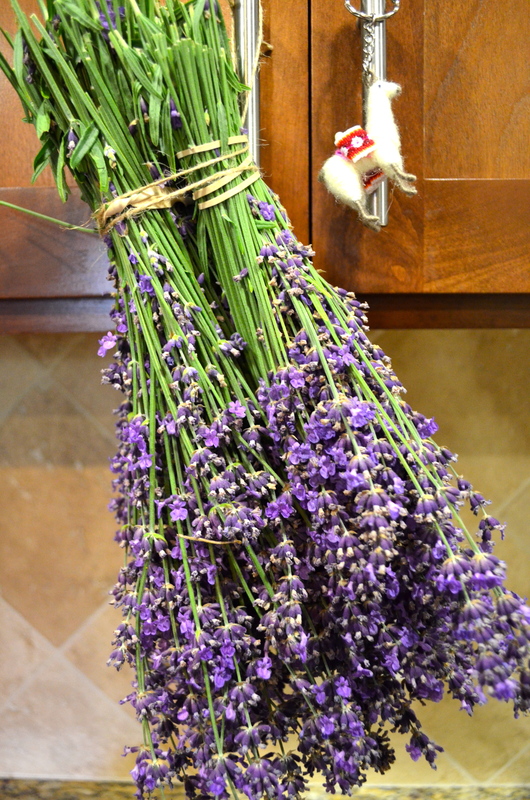 I definitely need this lavender in my garden! 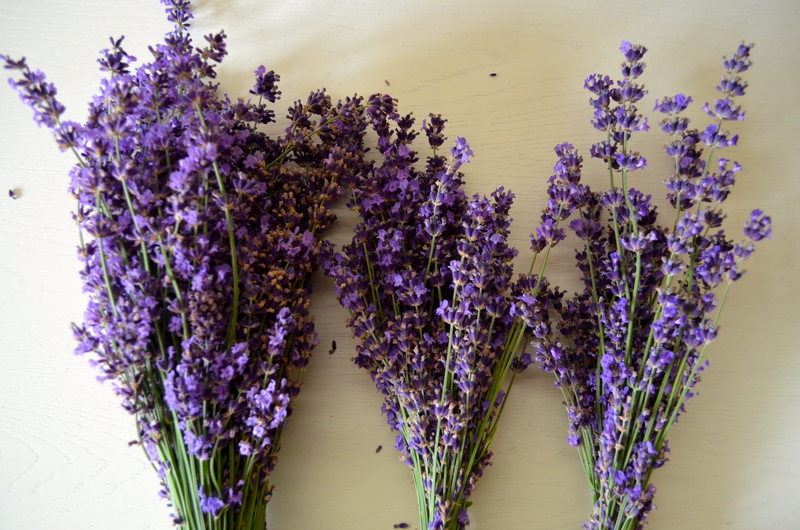 Tags: harvest, honey bees, lavender | Permalink. 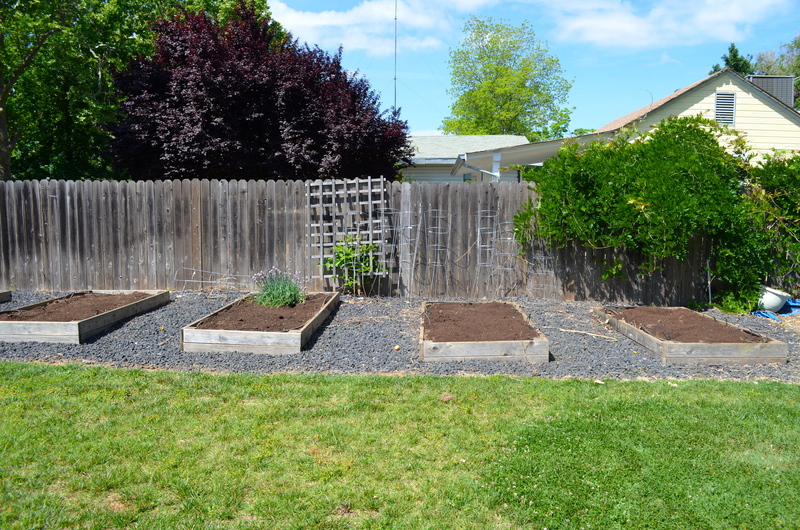 I always have my eye on other people’s garden space so when my brother and sister-in-law decided not to use their garden beds this year since they were expecting a baby, I jumped on the opportunity to double my growing space. 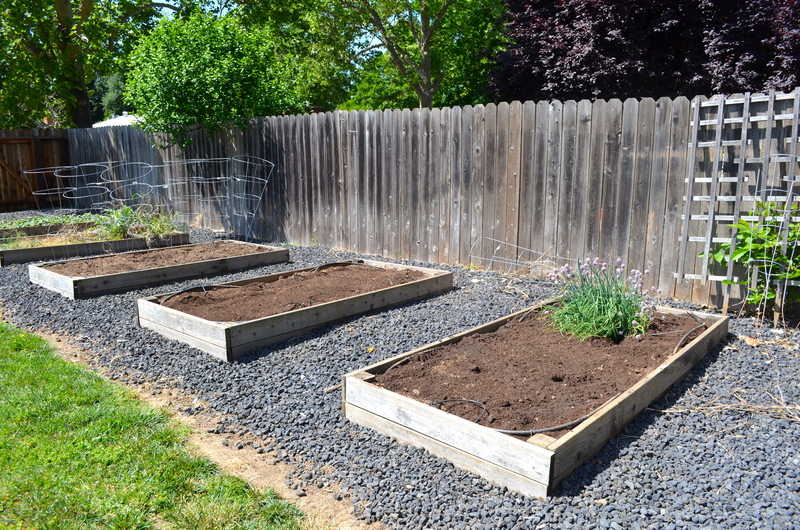 They have seven raised beds in total and told me I could use five. The other two are full of strawberries and asparagus. 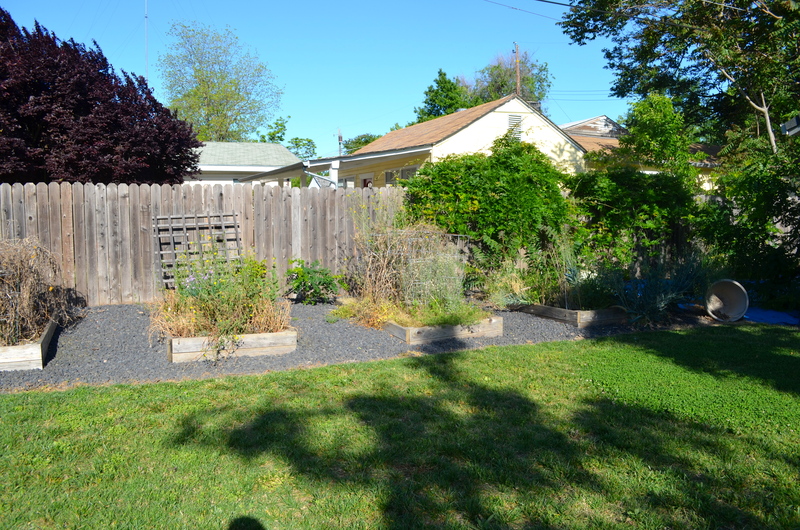 At the end of April, a friend, my daughter and I spend a day (or two) weeding, digging up the beds and amending with soil. 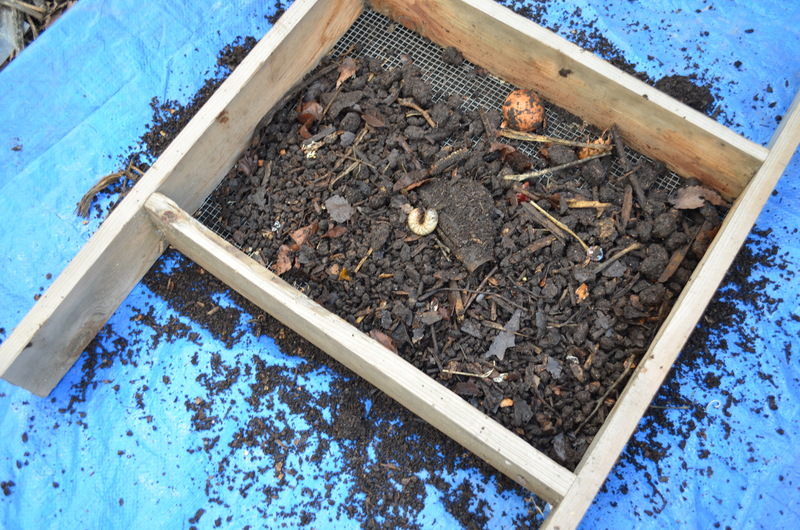 The beds were extremely dry and difficult to work. 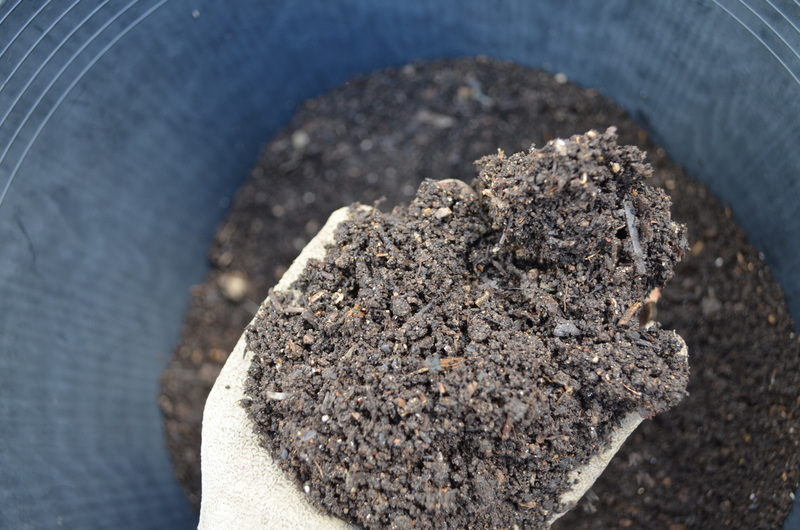 Also the soil level had reduced significantly from previous growing seasons so we hauled in about 25 cubic feet of Soil Booster from Green Acres Nursery and 5 cubic feet of Earthworm Castings. A flurry of seed starting happened immediately when I knew I was getting the space. 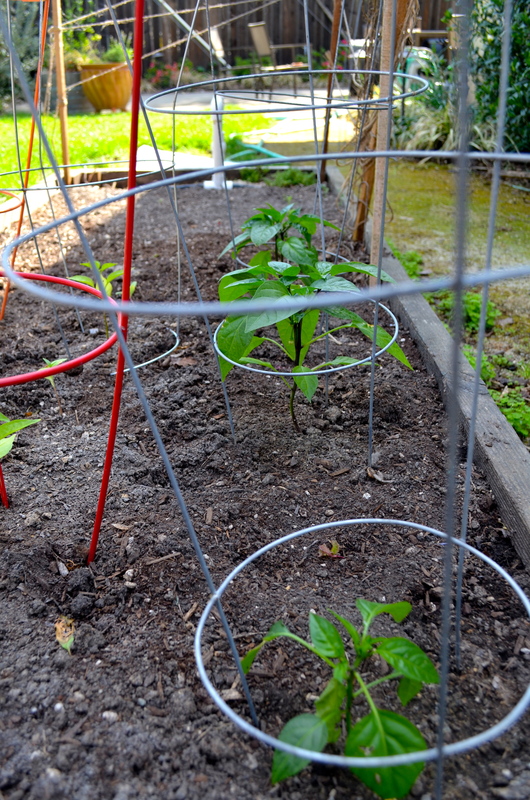 Because I will not be there every day to harvest, my plan was to plant things that don’t need constant attention. 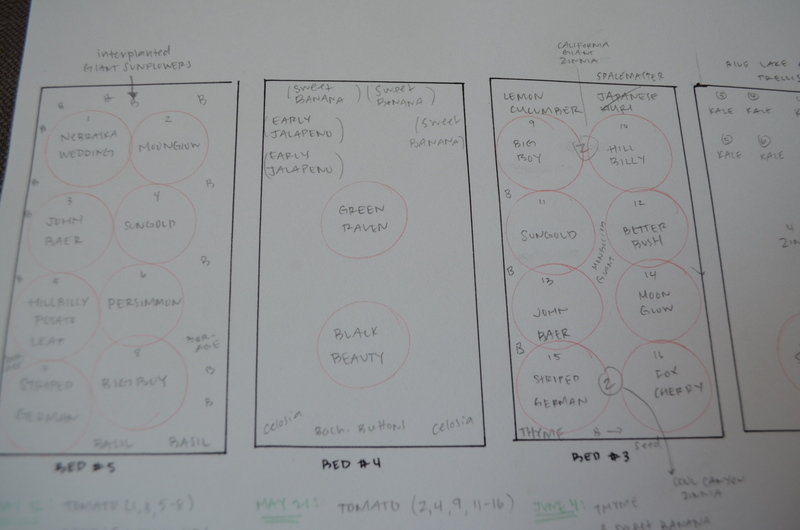 I drew up a garden plan of what I wanted in the garden. 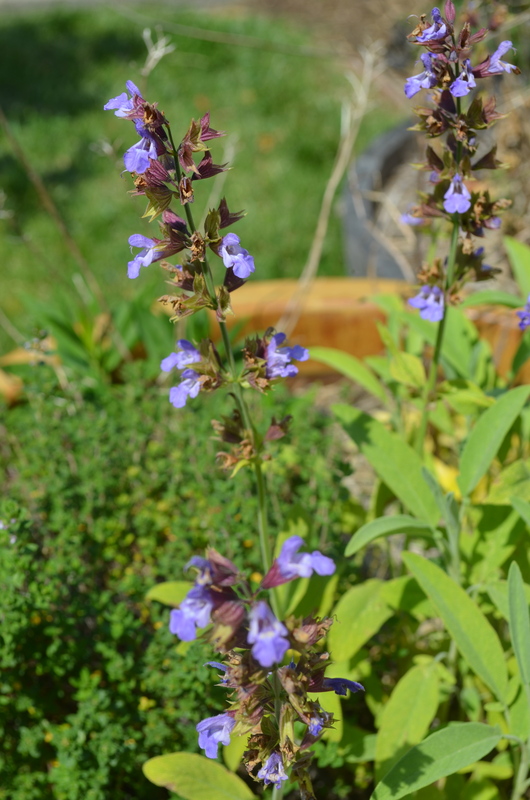 Since I started everything from seeds my plan changed based on what survived sprouting, up-potting and transplantation. Sounds impressive huh? I am pretty impressed with myself too! I can’t believe I was able to start all of these plants from seed and able to fill a huge amount of space that otherwise would have been unproductive. 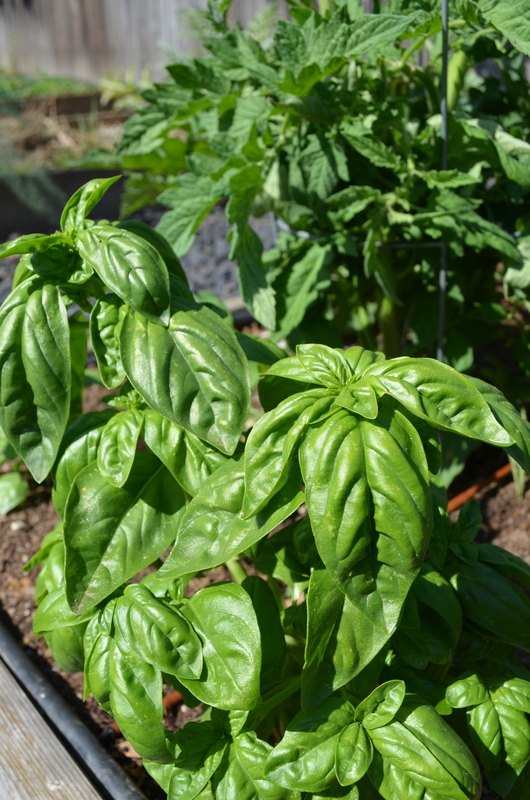 I’m still waiting for some small basil plants to get a bit bigger before I transplant them and I think I will tuck in a few herbs here and there. 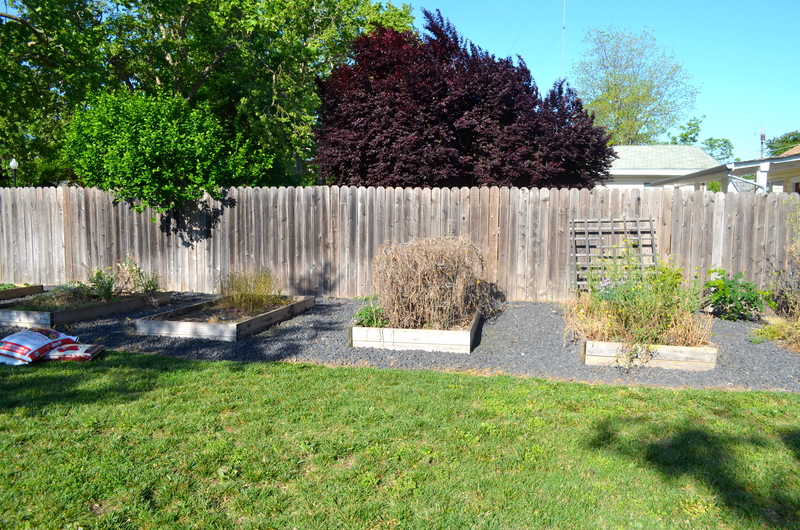 Otherwise, this garden is ready to go! 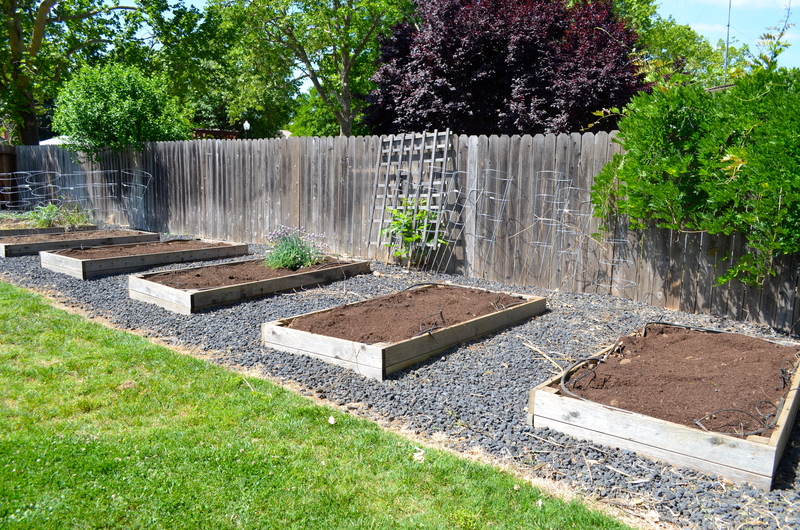 Tags: earthworm castings, garden plans, harvest, raised beds, seeds, soil booster, vegetable gardens | Permalink. 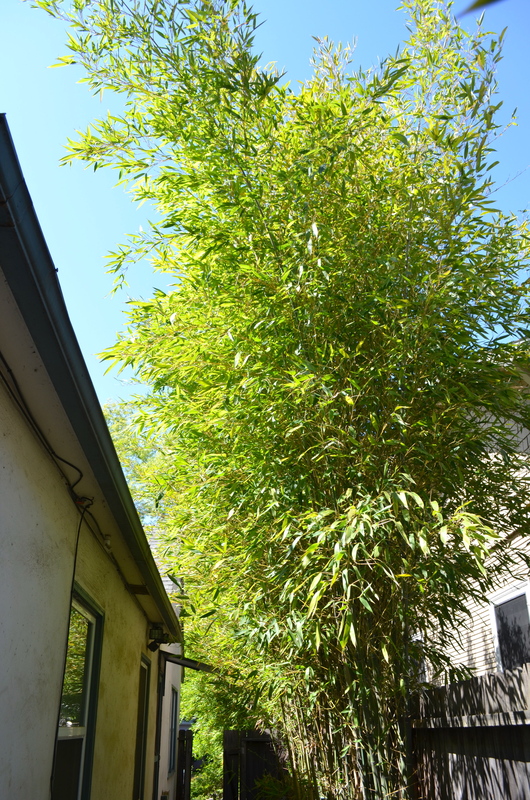 Bamboo is one thing I do not have in my garden… and I don’t really want it either since it can be highly invasive if you don’t put it in correctly. 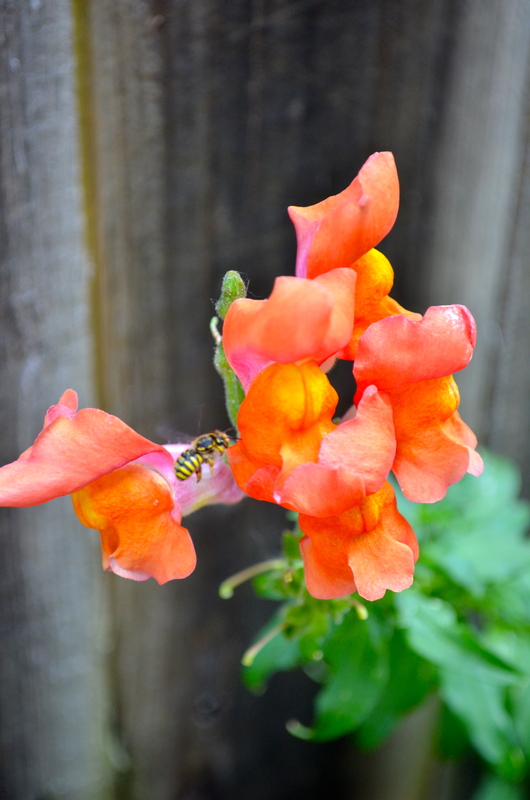 However, if it is taking over someone else’s garden… I’m all for that! 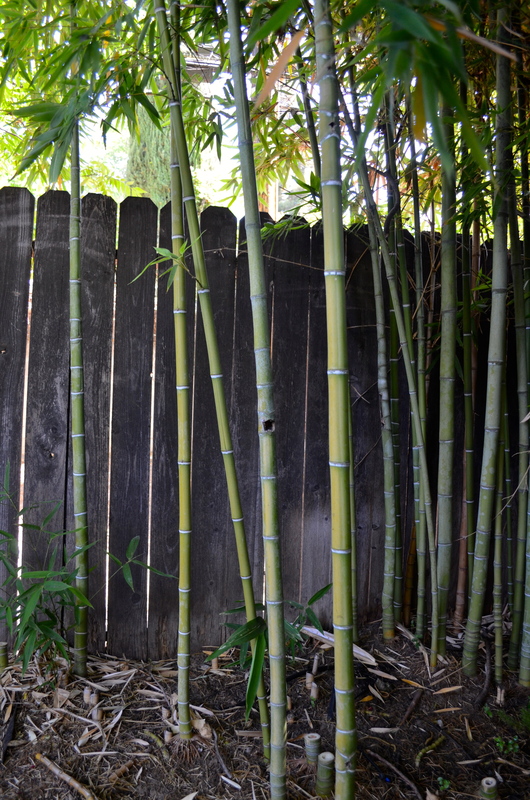 My friend’s garden has a bamboo problem and I offered to take some of it off her hands to use as stake poles in my garden. Total score! 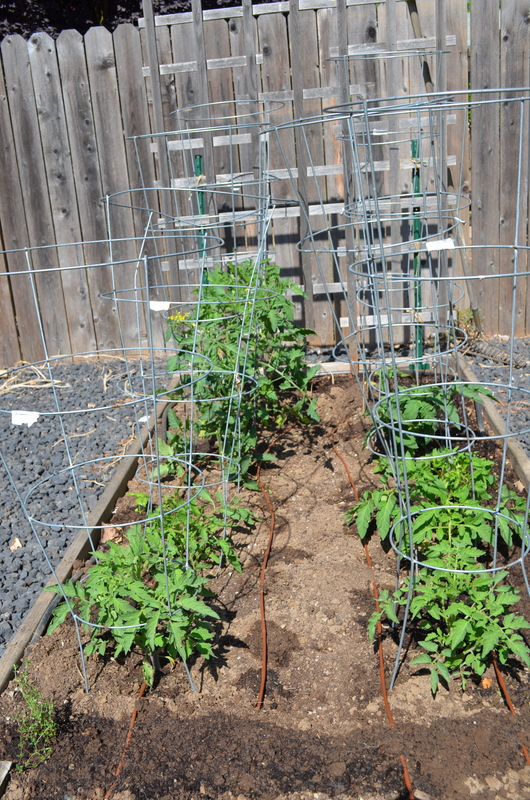 I’m going to cut down several to use as garden trellises this year but I think I read that you should really let them dry out for awhile before using them so I am going to cut down additional ones to store and dry for upcoming gardening years. I think my friend’s grove really needs some thinning and you can cut up to 1/3 of the grove every year without hurting the plant. I was able to cut down about 10 poles the other day which were about 18 feet tall and the larger bases were about 1 1/2 inches in diameter. I cut each pole into two pieces so I could fit them in my car. Finding poles of this size is pretty impossible at any store so I feel really lucky to have a source. 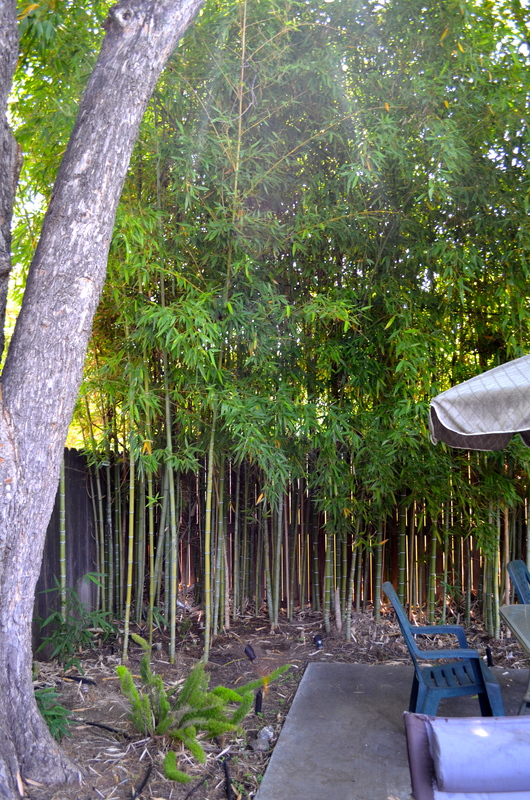 Plus cutting down the bamboo was really a lot easier than I thought it was going to be! 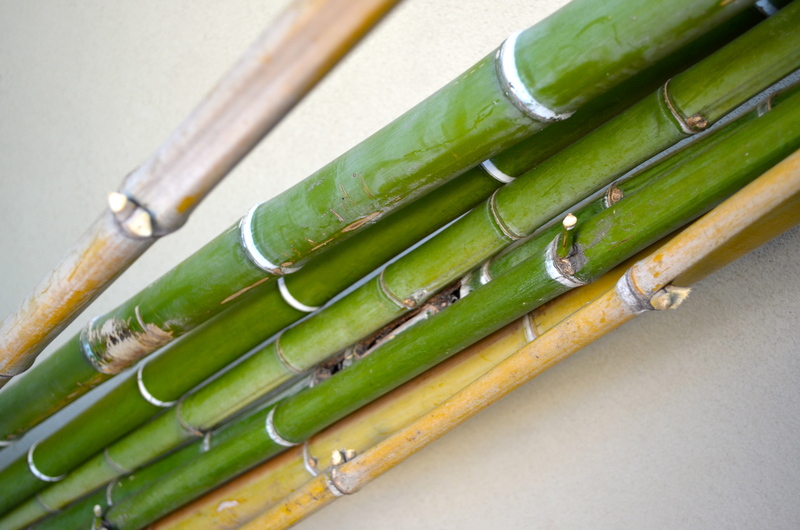 Did you know you can eat the young shoots of bamboo? 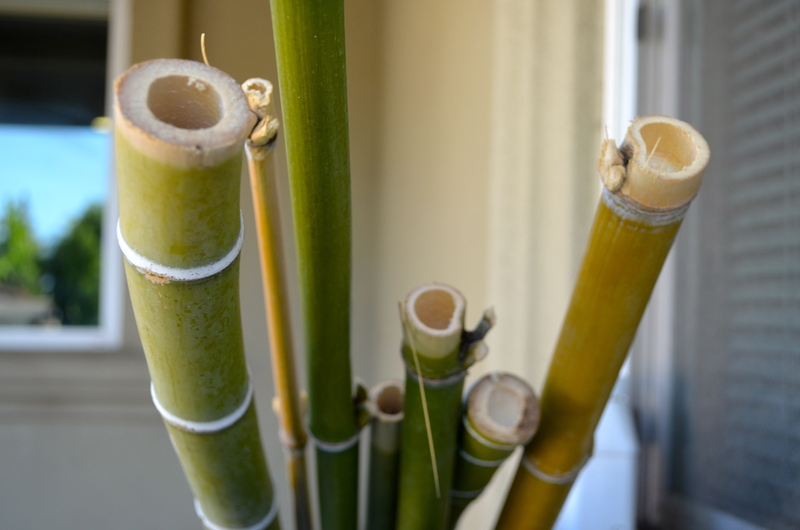 For several summers I went bamboo hunting with my aunt in Japan. 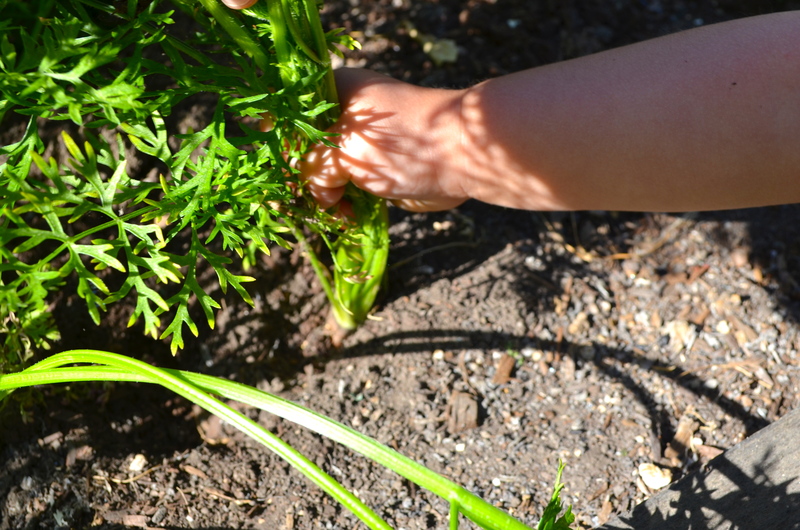 You look for the very very young shoots and with a little push they should break off pretty easily. Delicious! 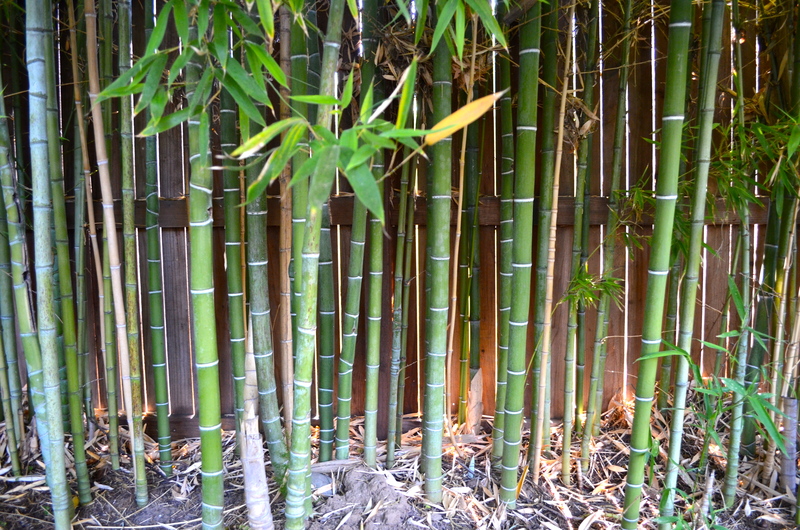 Tags: bamboo, trellis | Permalink. When we moved into the house, our garage had no built-in storage. Since we actually park both cars in the garage, we needed to find a solution to our storage issues. We hired a local cabinet company (their factory is even located in Sacramento!) to make us some upper cabinets and a work bench as well. 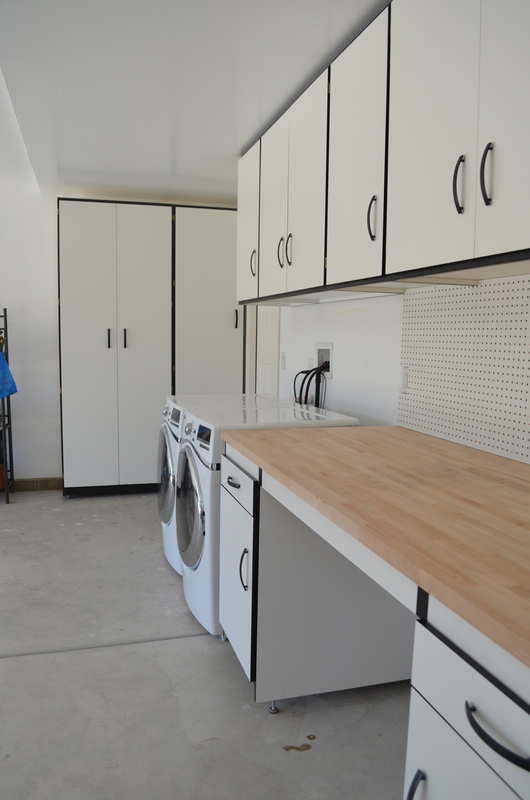 Also we had a little side area where I asked for a broom closet and a pantry closet. 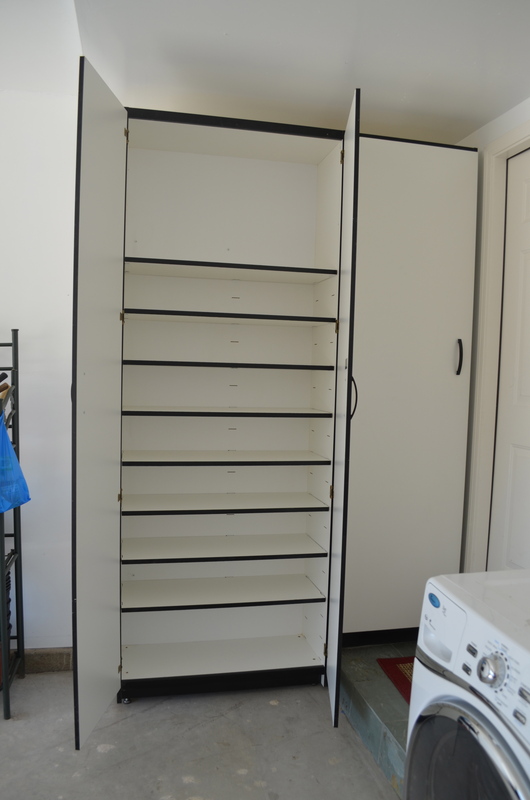 As you can see I asked for many, many shelves in this pantry closet because my idea was that I would be storing my many jars of canned goods as I kept up with the fruits of the garden. The shelves are moveable so I can move them to fit different size jars. Did you know that you are not supposed to stack your canned jars? 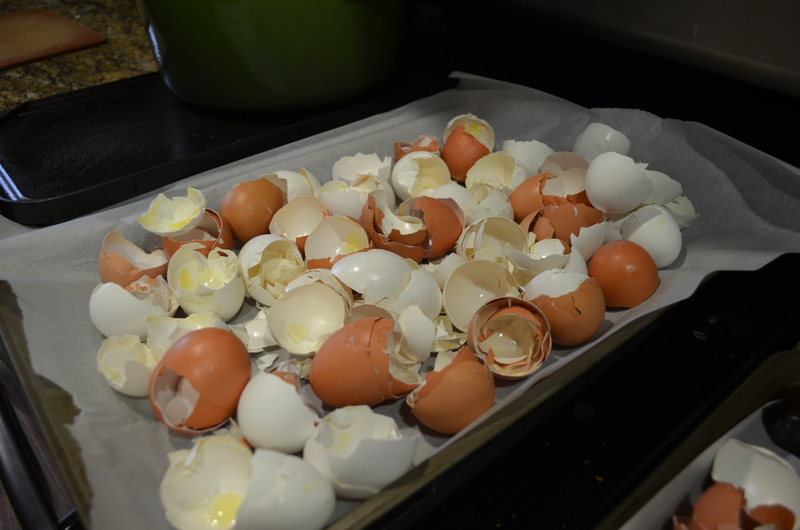 I was reading Theresa Loe’s blog post about canning and this post comments on two things I had never heard about. One was not to leave the rings on your cans when you are storing them. The second was not to stack your jars on top of each other. This made me think about my canning pantry and made me glad that I asked for extra shelves! This way I have plenty of room and wont be tempted to stack my jars. 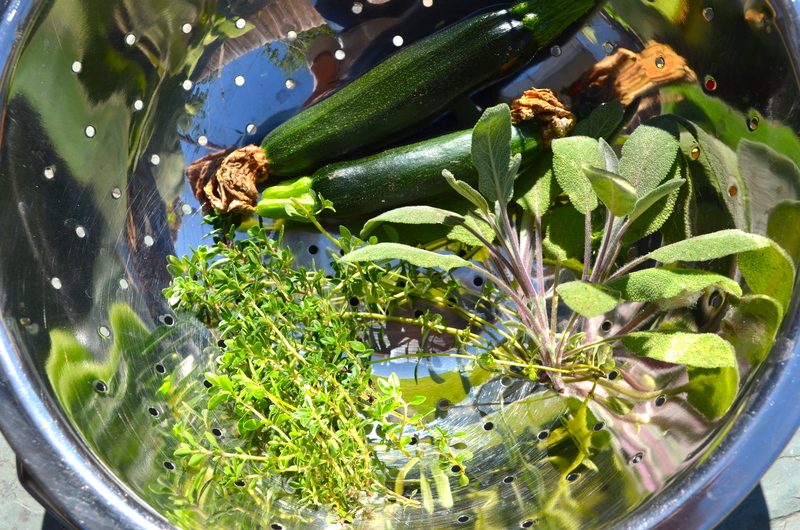 Tags: canning, food preservation | Permalink. 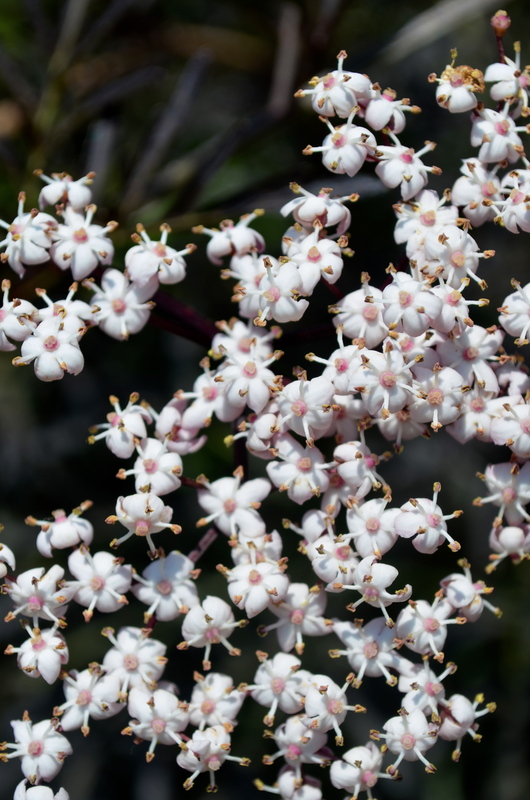 Tags: elderberry, flowers, garlic chives, pineapple guava, sage | Permalink. 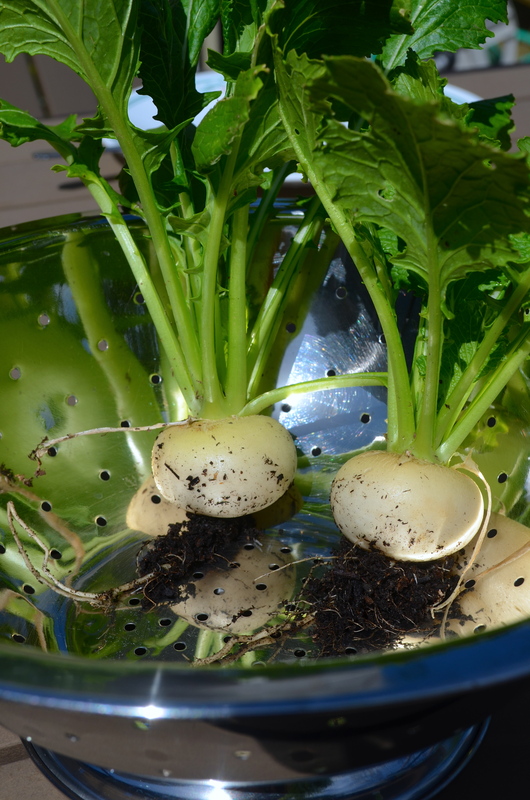 In late January, I planted a row of Renee’s Garden’s Japanese Baby Mikado Turnips. This is my first time planting them and I am happy with the results. 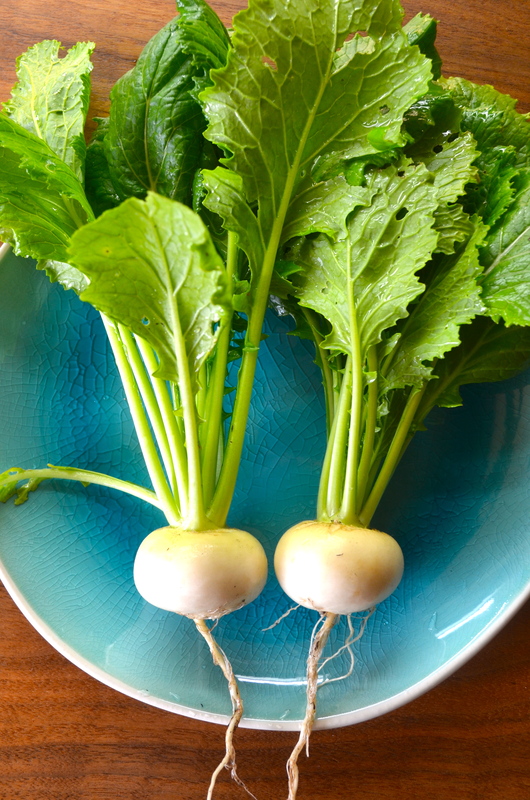 I usually plant Purple Top Turnips but sometimes it is hard to use up a huge turnip all at once so when I saw these baby turnips I thought it would be perfect. 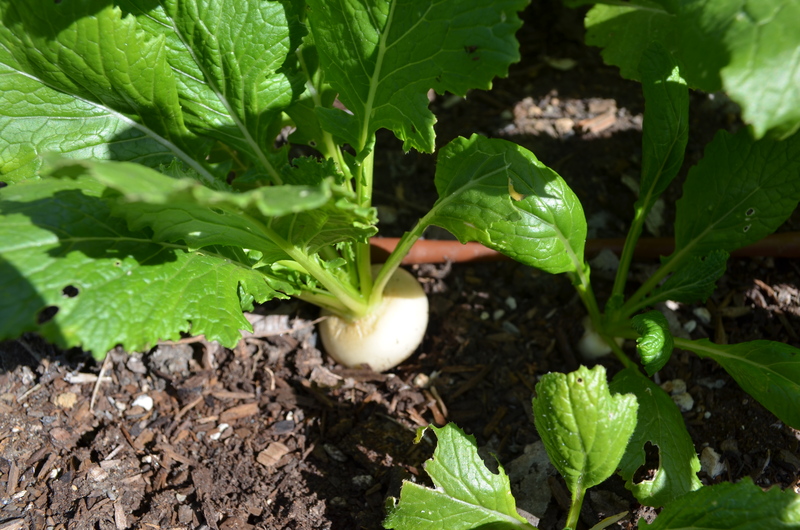 I planted a row of both turnips and while my baby turnips are ready for picking, my purple tops are still growing which means I will have an extended season of turnips! 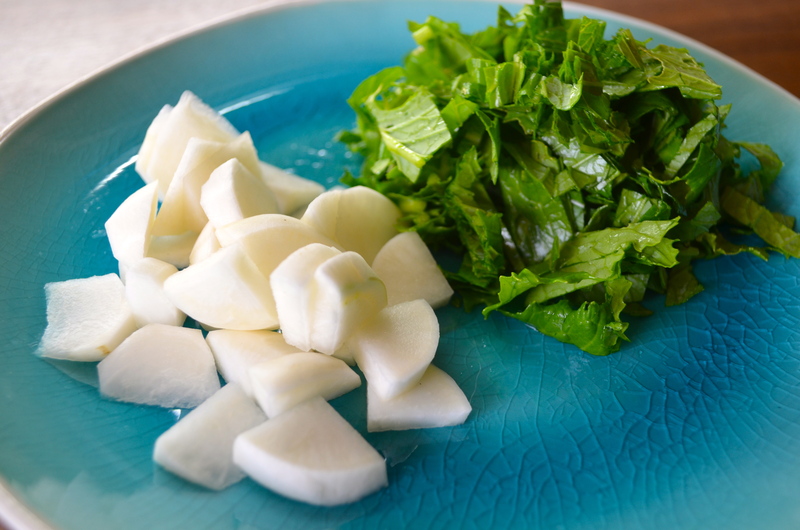 These turnips are about the size of a large radish. 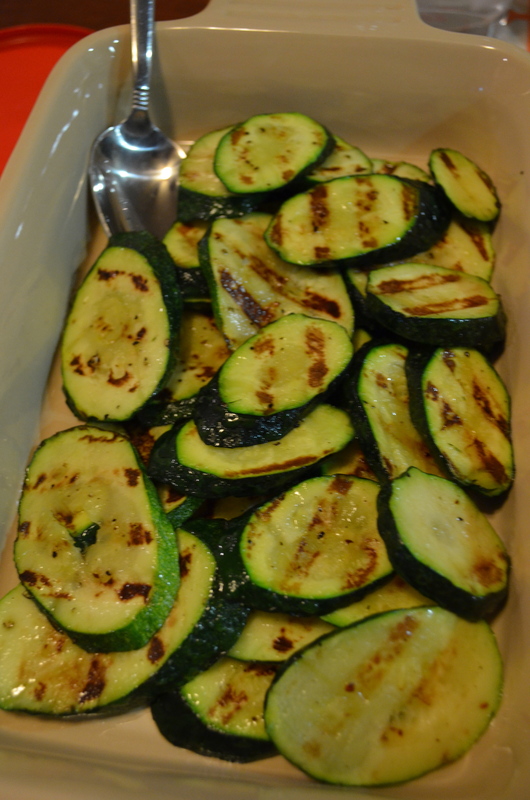 When I cut into them they have a very nice turnipy smell to them but when cooked they are nice and mild. 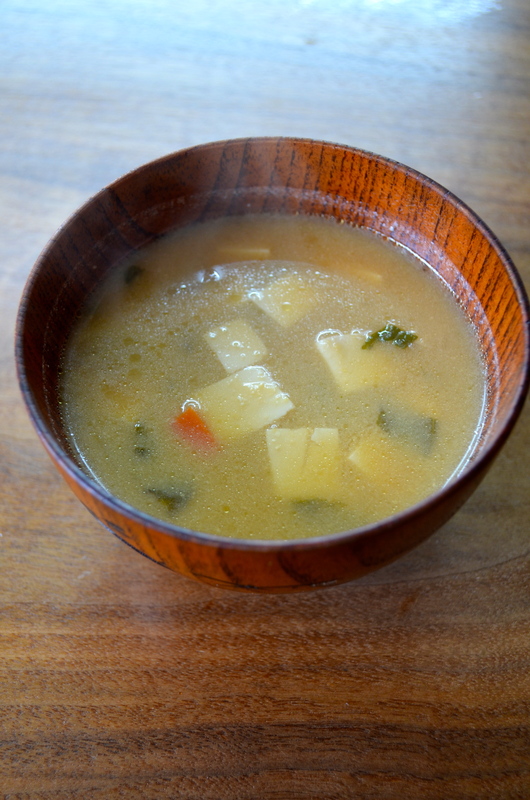 I wash both the turnip and the leaves and stir fry them in a little toasted sesame oil before putting them in miso soup. Yum! East Sacramento Farmer’s Market Begins! Help support the East Sacramento Farmer’s Market by stopping by this Saturday April 4 in McKinley Park! This will mark the second season of our market. 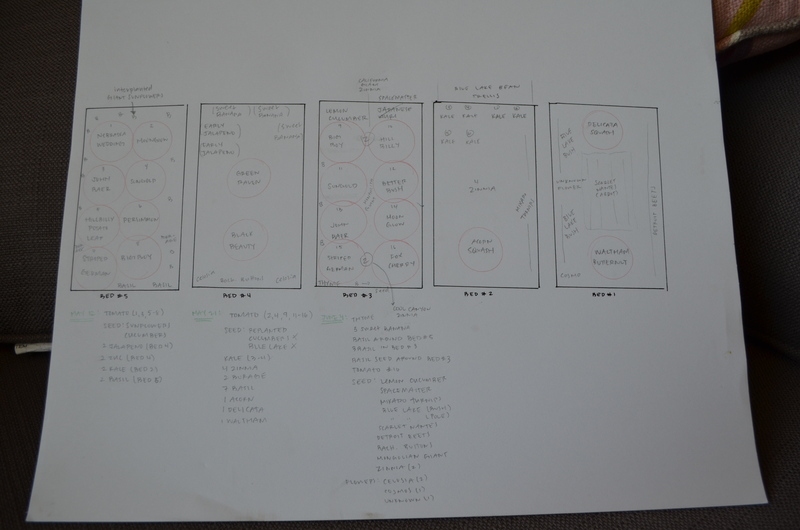 I’ve been helping organize the market this year and I am really excited to be involved. You can find out more information at the market’s website here. Also click contact if you want to join the mailing list! Tags: East Sac, East Sacramento Farmer's Market | Permalink. 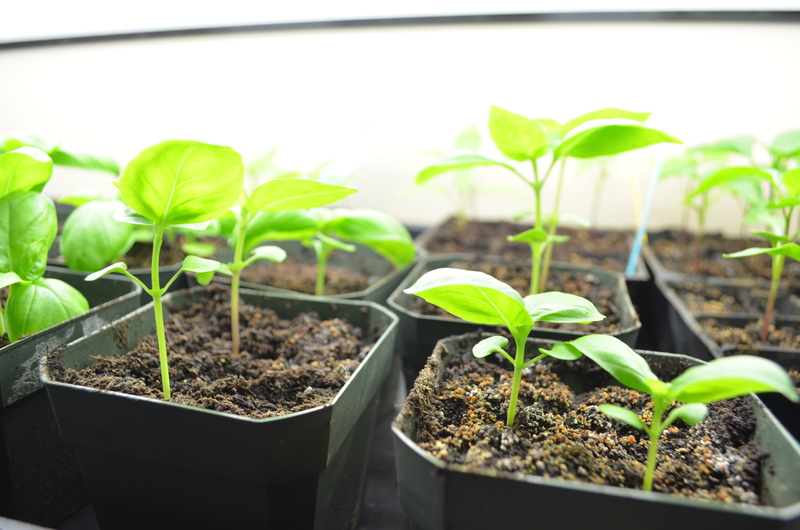 A few weeks ago, my seed starting operation was in full swing and I was at a tipping point of having too many seedlings and nowhere to put them! I have a heat mat which can hold four trays of seeds. 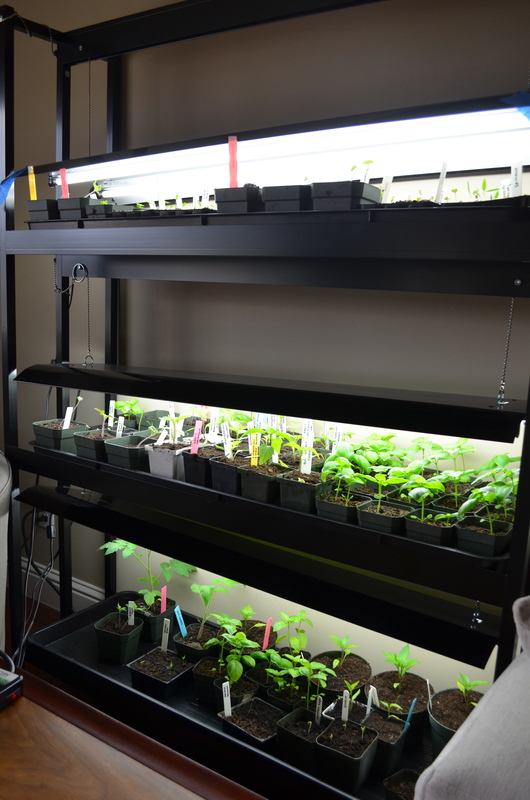 Each tray can hold 8 six-packs of seeds although I only use space for 7 for easier watering access. 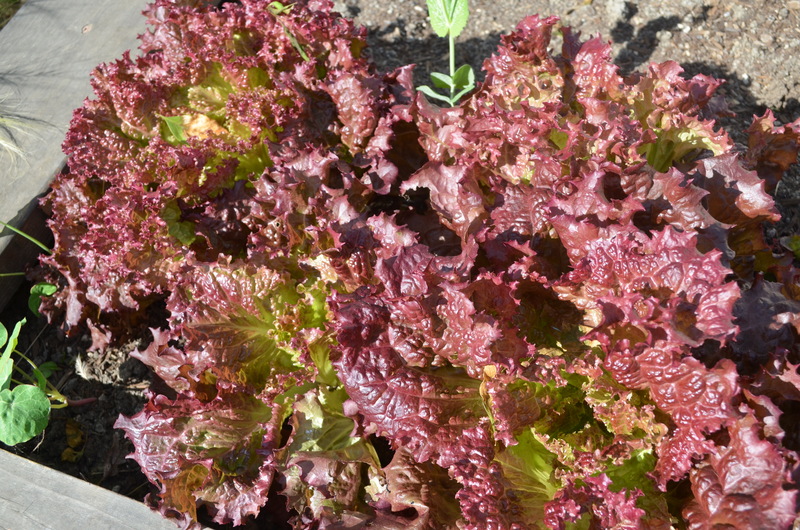 I start fast growing things such as lettuces, spinach, kales in six-packs. 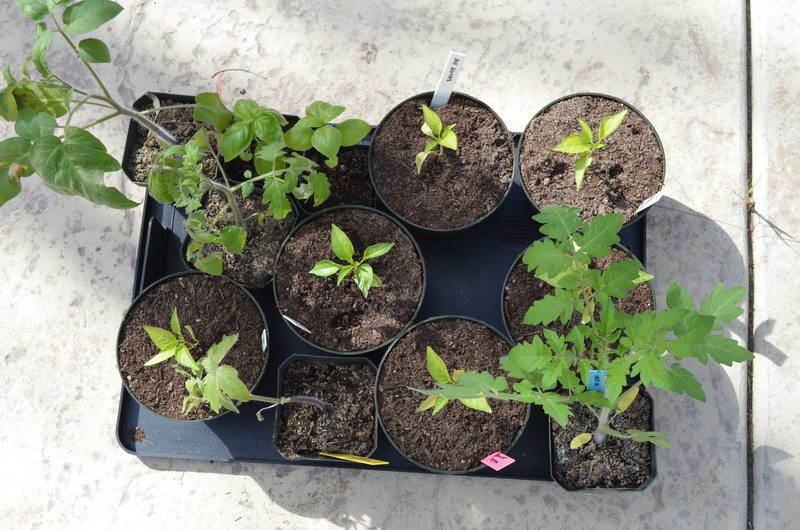 I start bigger plants in larger containers mainly because I want to do as little up-potting as I can before the plants go out in the ground. 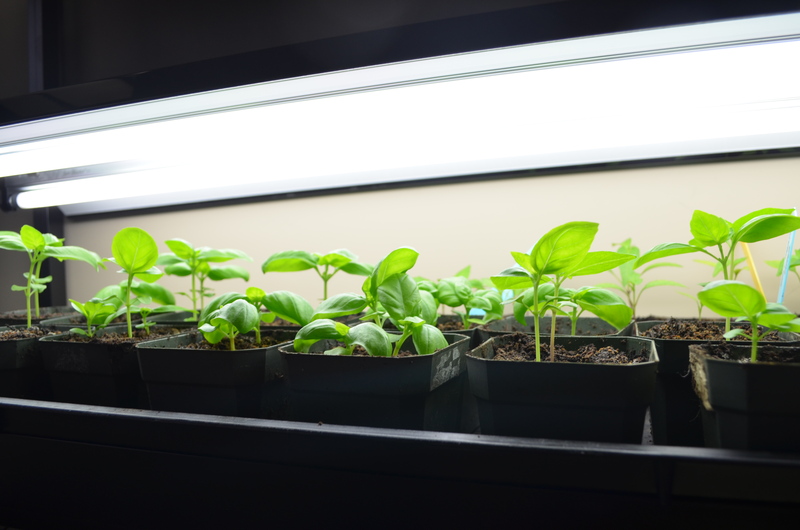 At the beginning of March, my problem was that I have three trays on my grow light system and it was filled to the max. 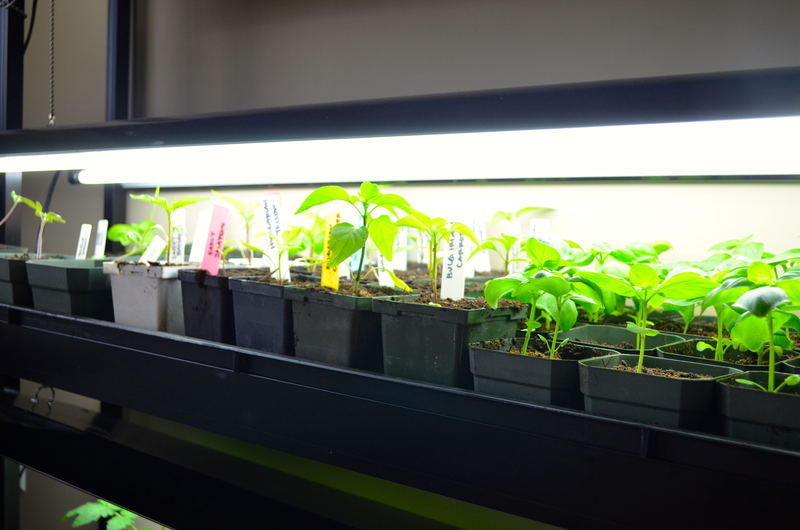 This means I had to do a lot of shuffling around when my newly sprouted seeds come indoors to the grow lights. 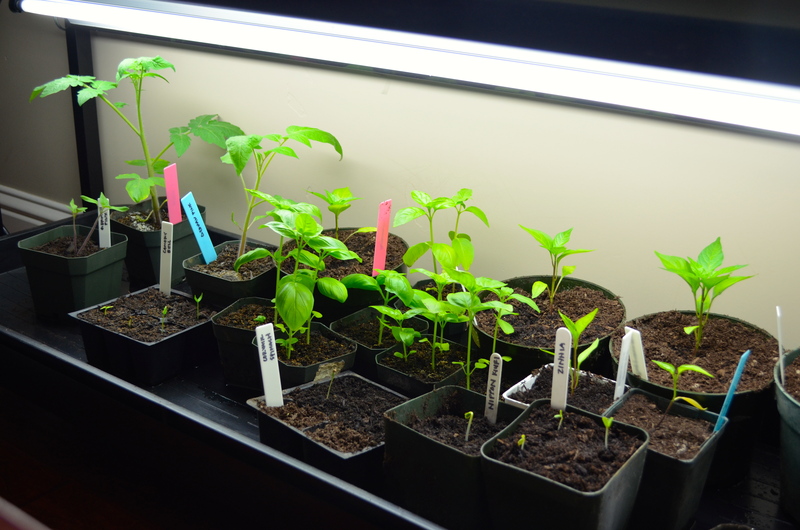 My top tray is for seedlings in their first week of life and as the plants grow bigger they get kicked down to the medium tray and finally to the bottom tray. I have rigged the lights on each level at various heights. 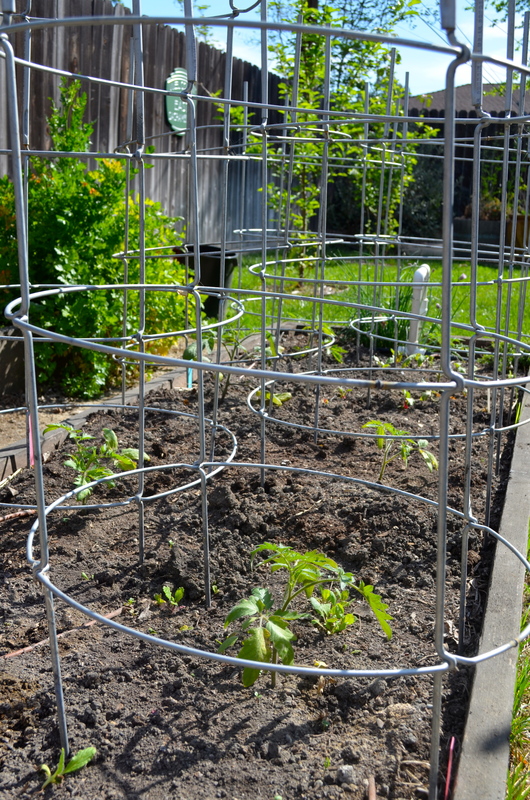 Now the problem lies with the lowest tray which has the tallest plants. 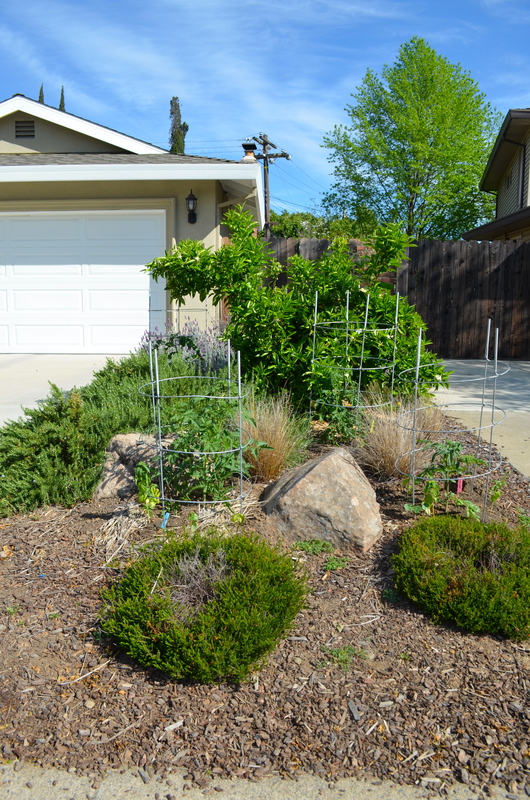 These plants look big enough to be transplanted outside but one always worries about the impending last frost (that may or may not happen). So a few plants are now bravely outside. Last weekend, I finally got out and added some plants into the ground. 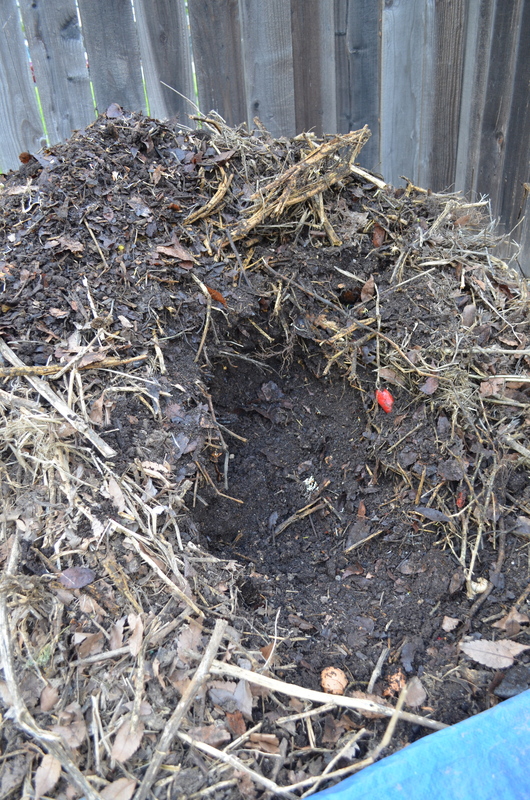 I first sifted my large compost pile and dug big holes into the ground. 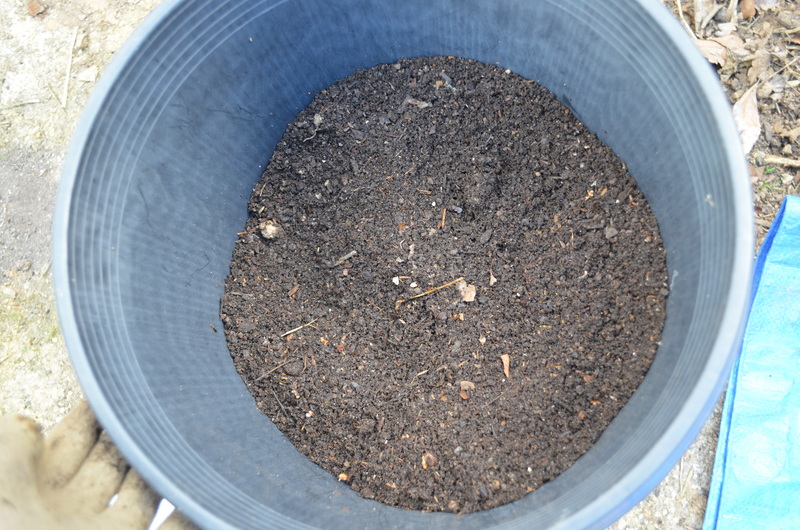 I put in a huge bucketful of my compost into each hole, added egg shell powder and some E.B. Stone Tomato and Vegetable Food into each hole. 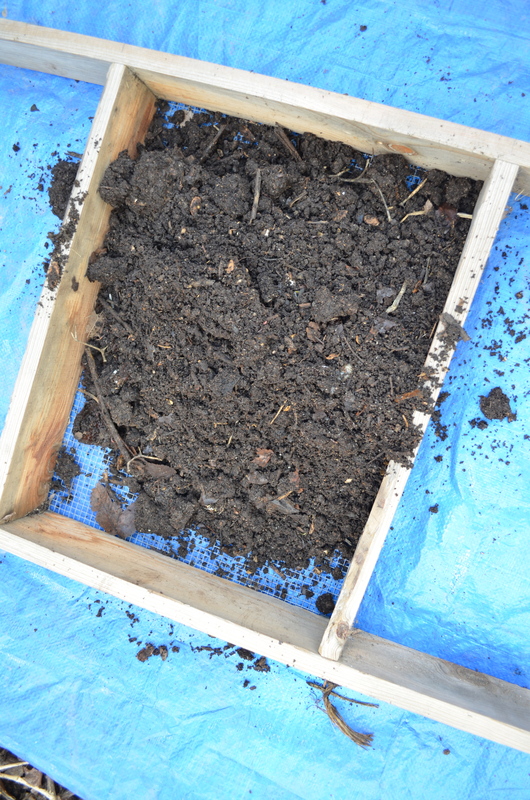 After preparing the soil, I planted some tomatoes. My front yard has a little strip of land between my driveway and my neighbor’s. 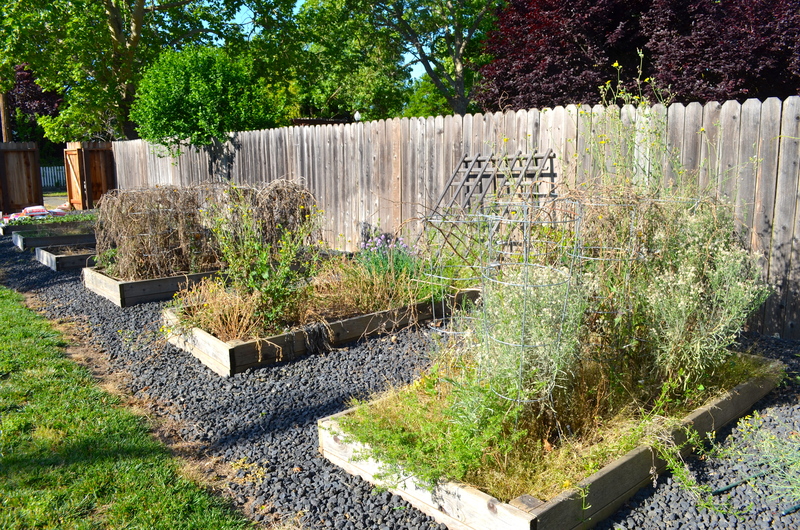 This would normally would be non-productive grass but I converted the space to be one of my main tomato beds. 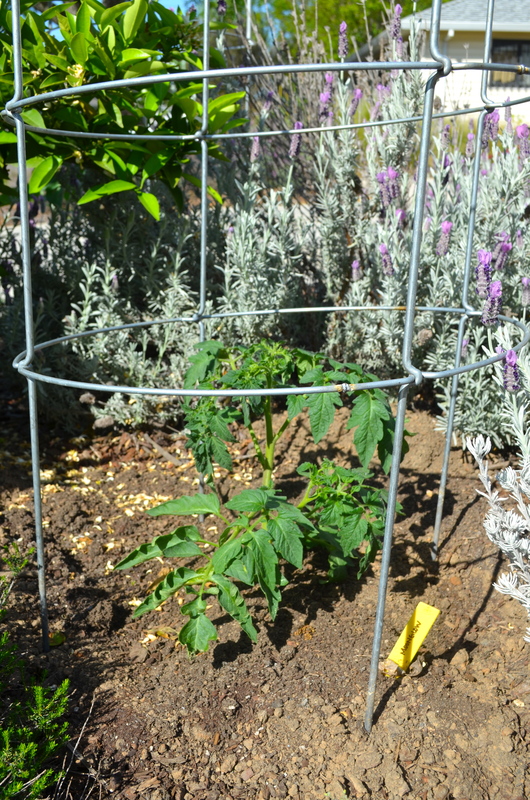 Amongst the lavender and fruit trees I planted 5 tomato plants. 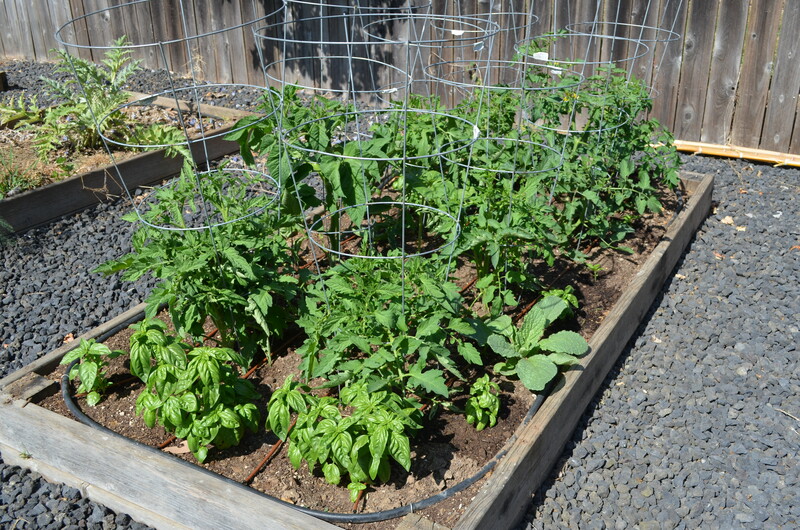 I used one of my raised beds in my backyard for the rest of the tomatoes. I interplanted tomatoes with basil, borage and nasturtiums. 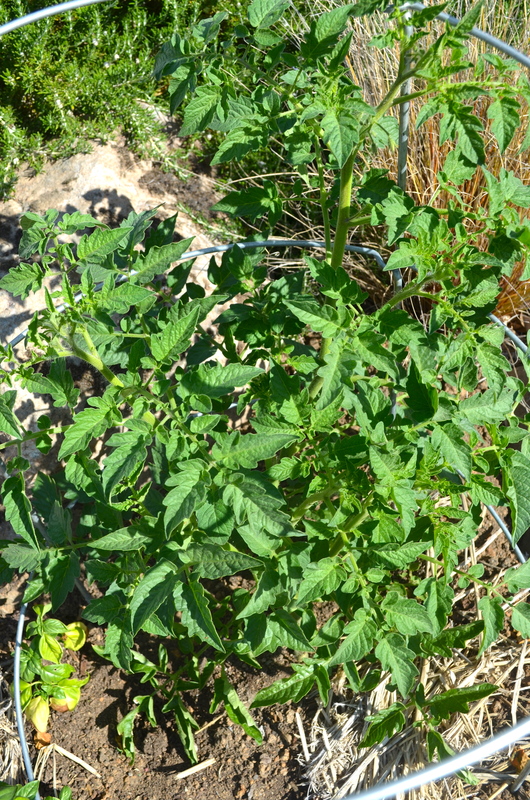 I am really hopeful that this year is my year for tomatoes since last year was so pathetic. I’ll keep you all posted on the progress. Wish me luck! 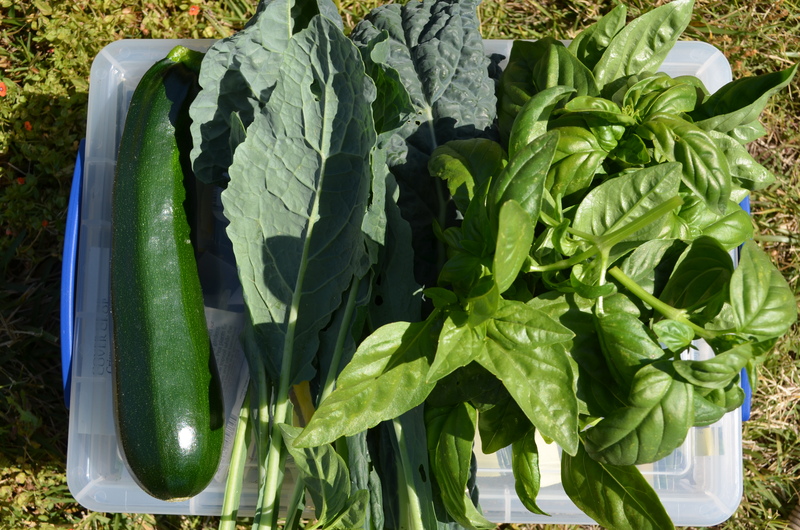 I haven’t been good about my garden tally lately but February was a one-veggie-harvest. 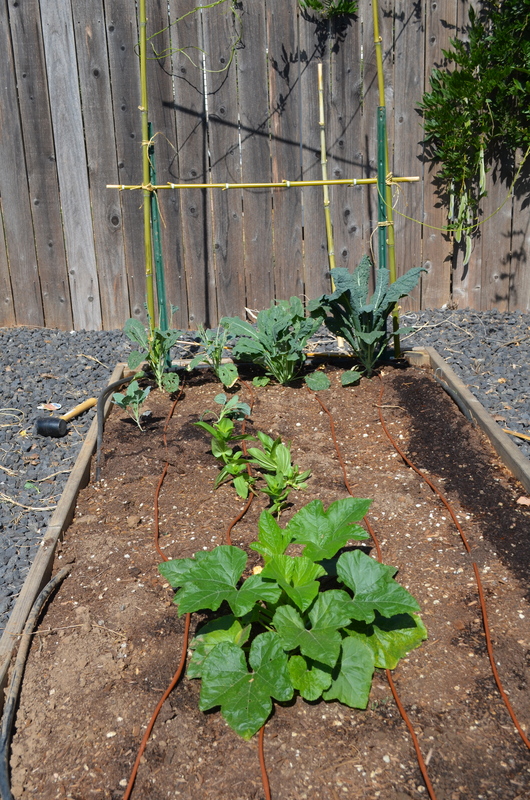 All I harvested was kale! I have been eating about 4 cups of kale a day in my delicious kale caesar salad which has completely stripped my Lacinato plant bare. I had to give it a rest and let it grow a bit so it was the first month I actually had to BUY kale. All to feed my kale habit. 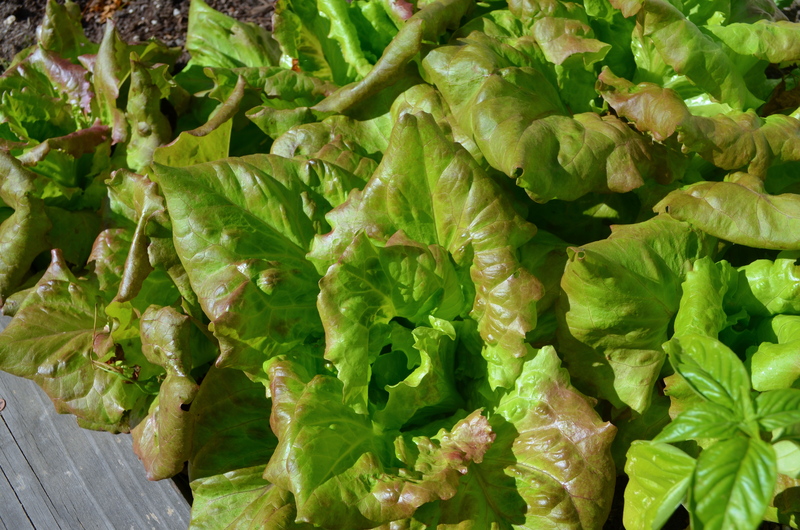 March added lettuces and strawberries to the harvest. 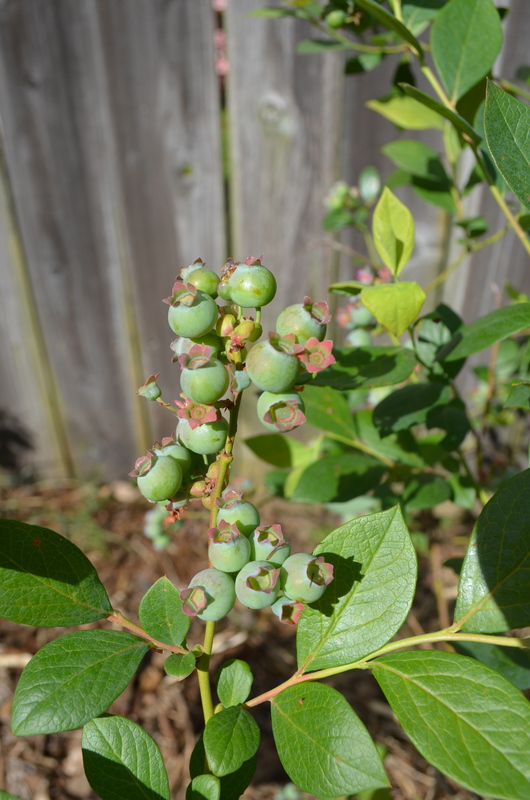 I’m looking forward to my upcoming harvests! 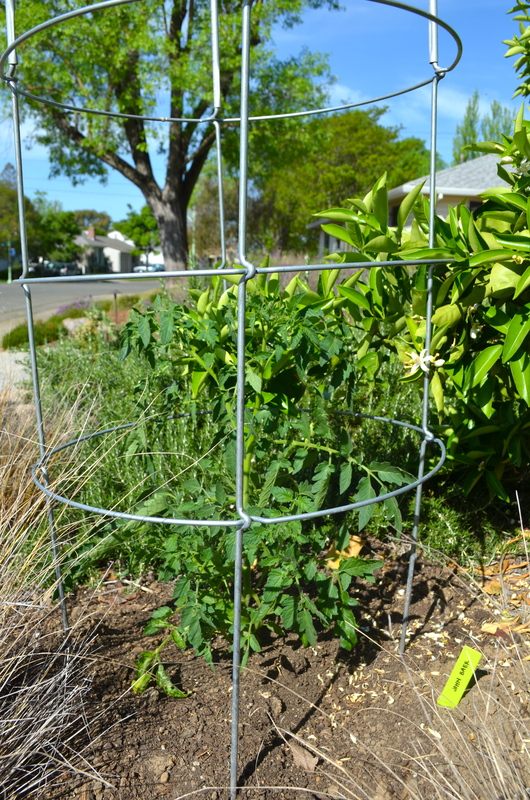 Tags: compost, compost sifter, grow lights, march garden, seeds, tomato | Permalink. 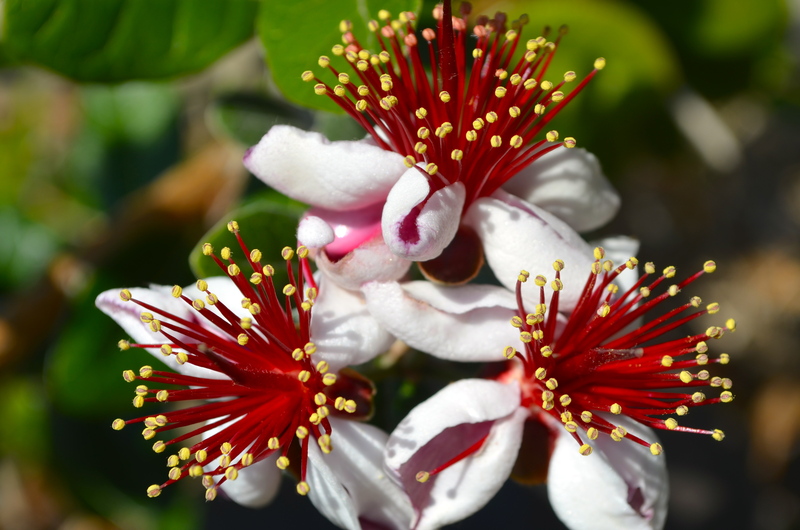 I know I mostly write about gardening but occasionally I have other things in my life I would like to share. I have been working on a special baby gift for the last couple of months for my sister and brother-in-law and although it is not garden related I thought I might share it anyway. 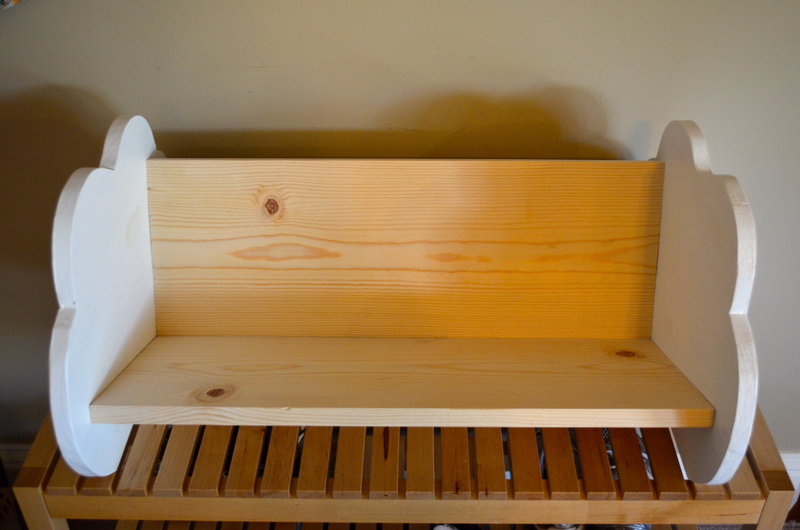 I have been trying to work more on my woodworking skills (which do come in handy while gardening) and I wanted to make a small bookshelf for the baby. Now as a former teacher, setting up an environment for a baby or child is very important to me so I didn’t just want to give the baby a bookshelf but an entire reading “environment.” So my gift expanded as I began working on it and I love the results. First the bookshelf. 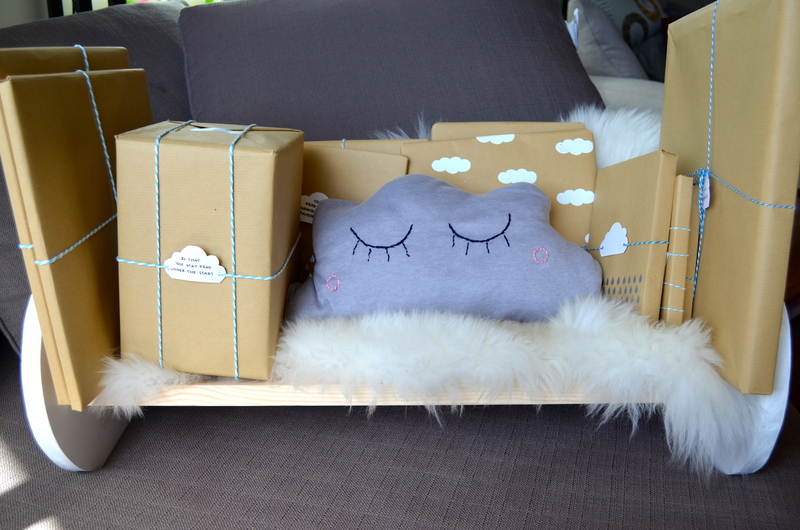 I came across this cloud bookshelf while searching the internets and thought I could make this myself! 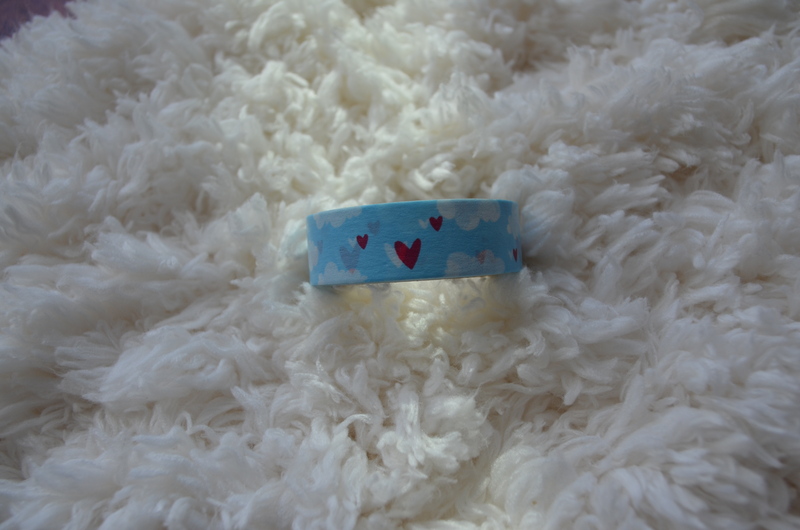 So after a little bit more searching I found a DIY version over at Lay Baby Lay. 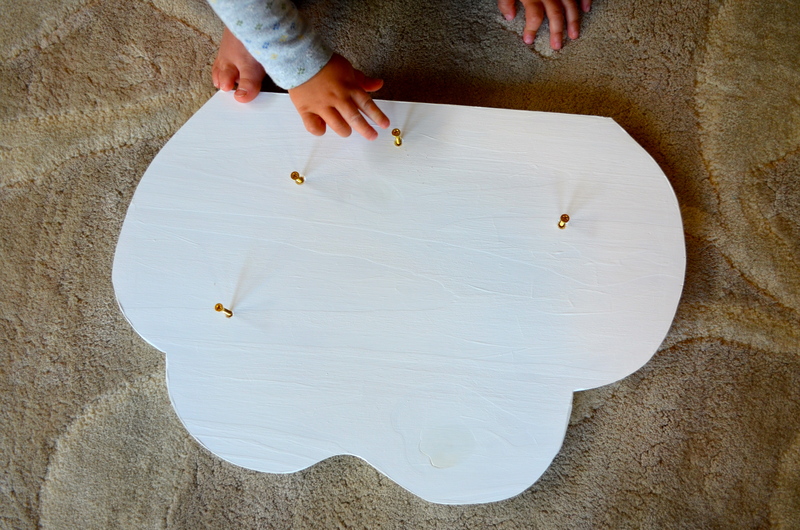 Although she made a heart bookshelf I knew I could easily make a cloud shape instead. 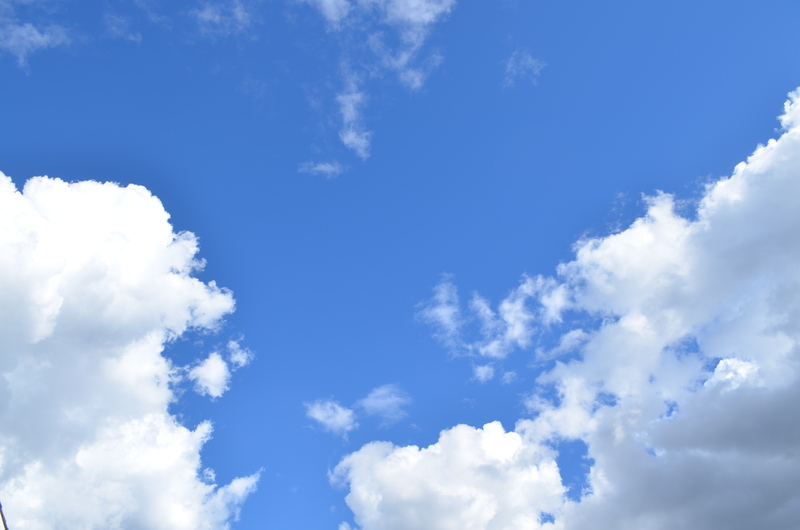 I asked for my dad’s help and to borrow his saber saw and after breaking two blades we had clouds! 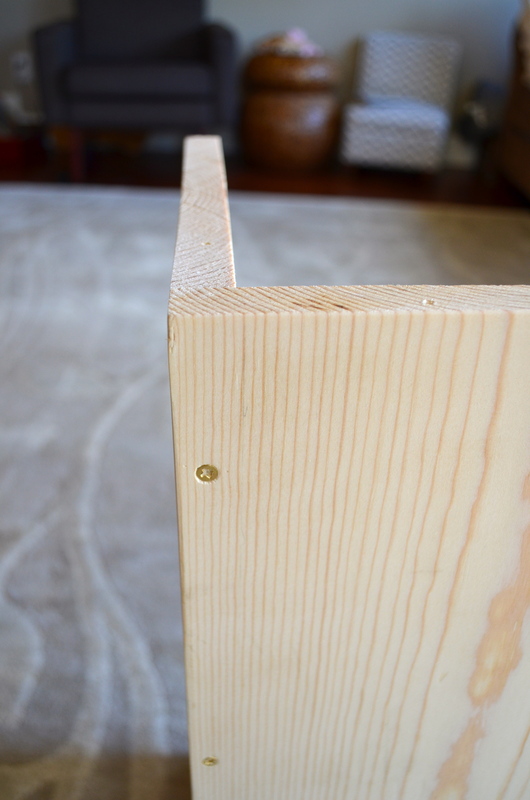 Although the construction is fairly easy, you do need two sets of hands to hold the wood together while assembling. 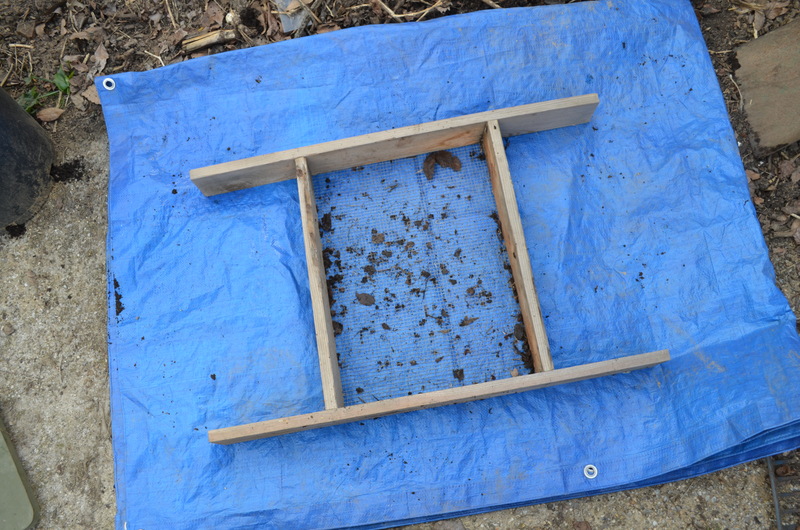 First we cut down the 1 x 10 x 4 common board into two 2 feet length pieces. I attached them with four #6 1 – 1/4 brass screws making sure to counter sink the screws. 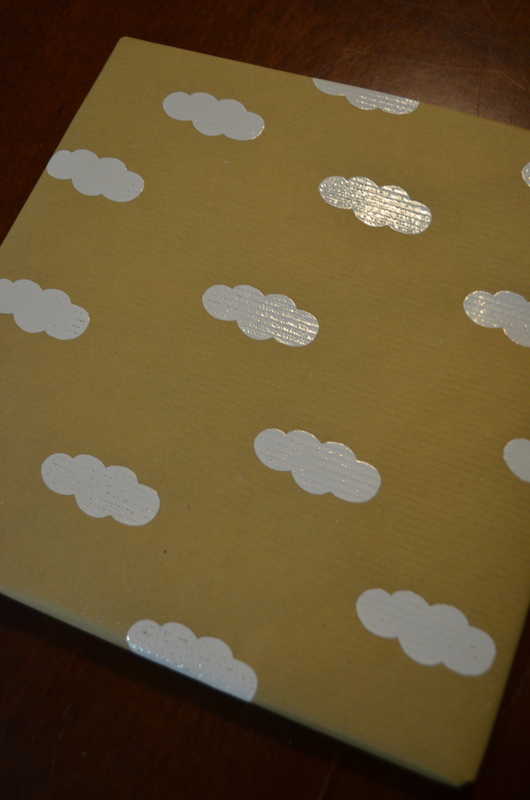 Then I took a large piece of cardboard to make a stencil to figure out how big I wanted the clouds to be. This took several tries but once I got it right I traced my stencil onto the 1-1/8 inch x 23-1/4 inch x 4 ft. edge-glued board. I used a saber saw to make the cuts. 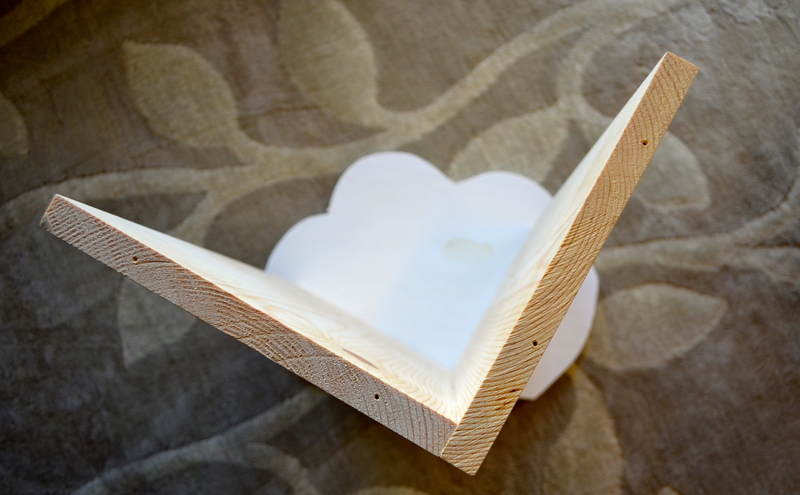 The rounded edges of the cloud proved to be a bit difficult for the saw blade but working slowly helped. 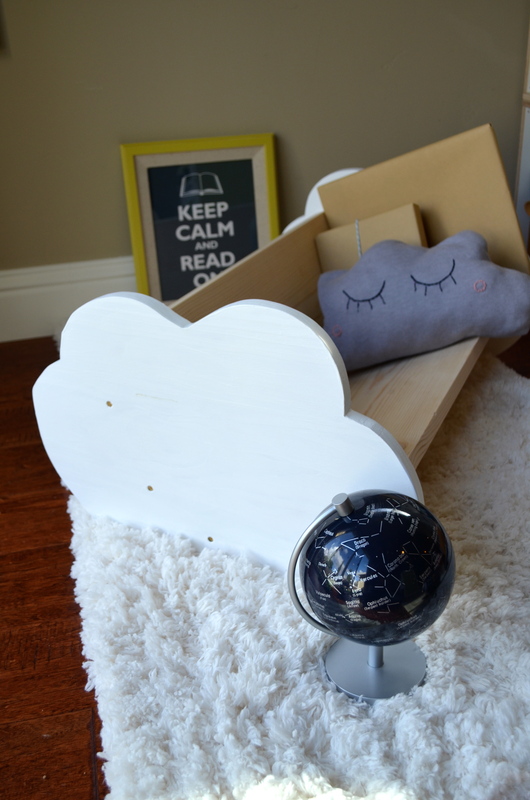 In the process of making my cloud bookshelf, my brother-in-law decided to do a star and galaxy theme for the baby’s room so my cloud theme couldn’t have been more perfect! 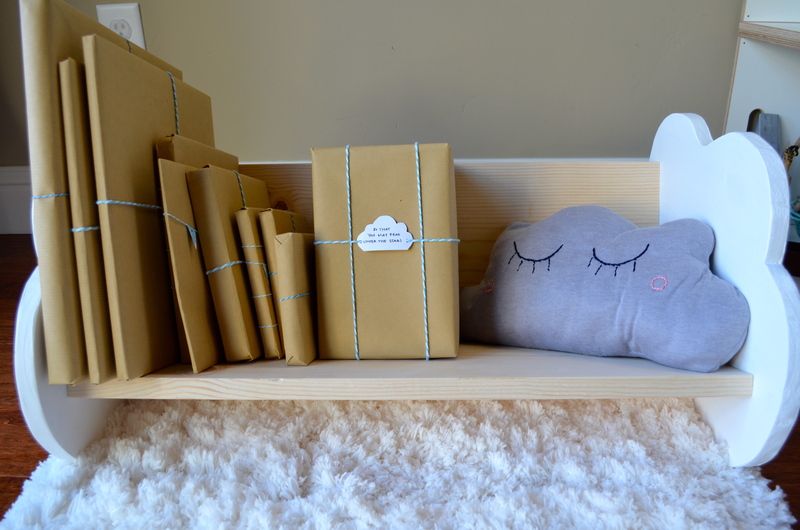 Since my sister-in-law has hardwood floor, the baby would need a cozy rug to be placed in front of the bookshelf. 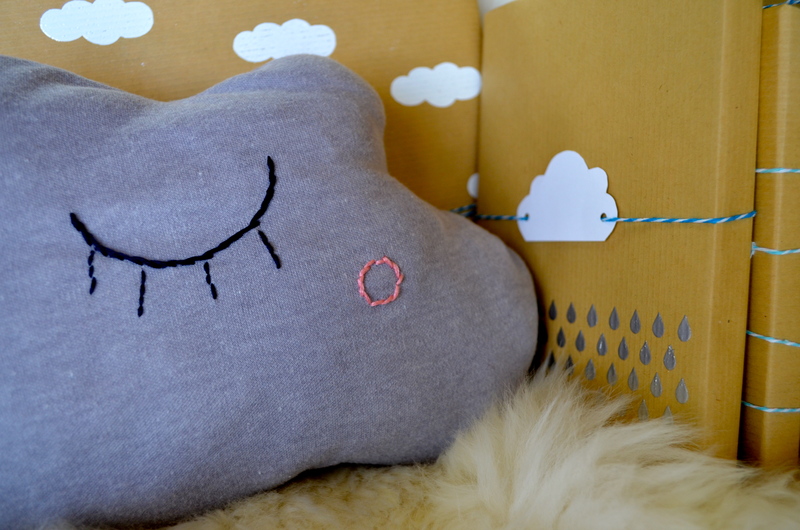 And a baby always needs a sleeping cloud pillow to keep him company while reading. 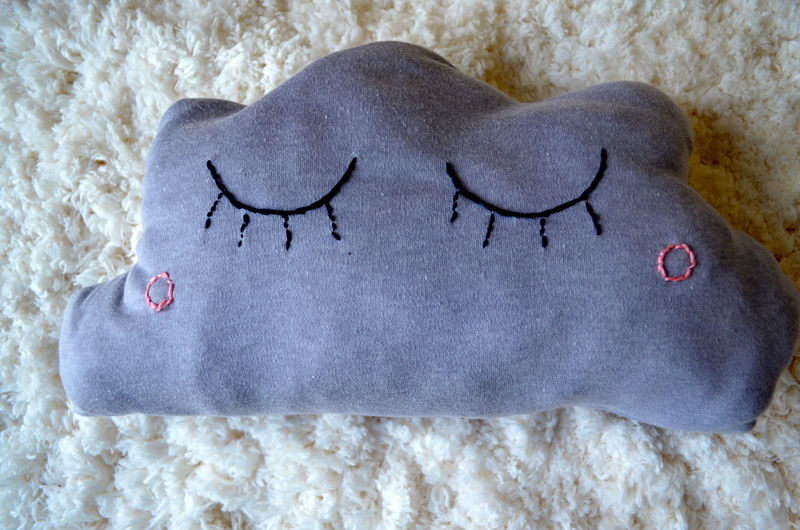 I made this cloud pillow using some of my mom’s scrap fabric, and her sewing machine. I hand stitched the eyes and cheeks using embroidery thread. 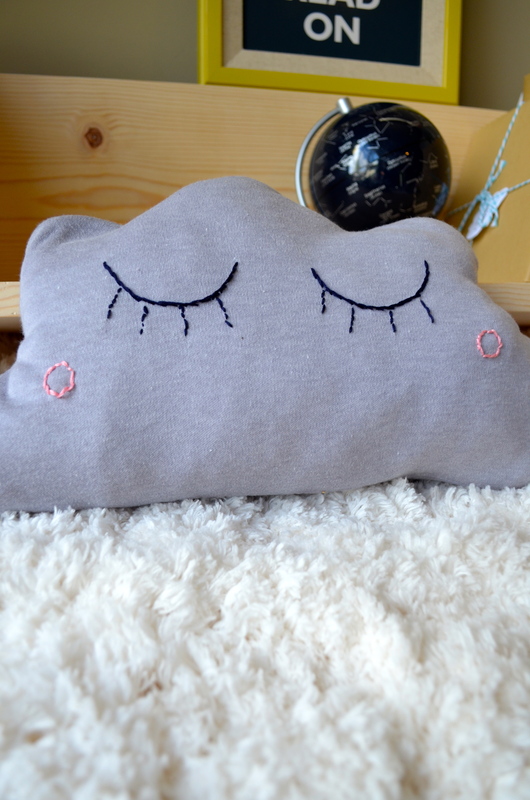 For a simple cloud pillow tutorial you can click here. 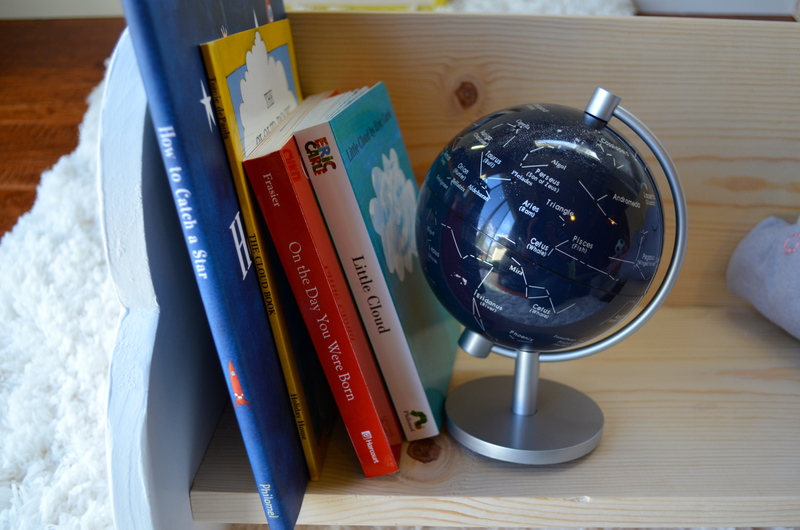 Now you can’t have an empty bookcase so I searched for books about clouds, stars, and other classics to add to the shelf. I also added this Sleeping under the Stars nightlight because you can always use some mood lighting when reading books. 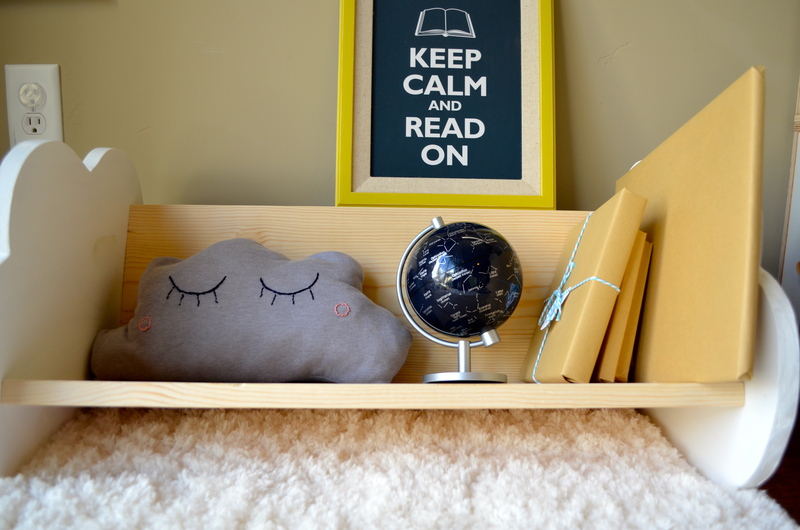 I framed an inspirational quote for the baby (and parents) because one must always remember to, “Keep calm and read a book.” For me, usually it is a gardening book. 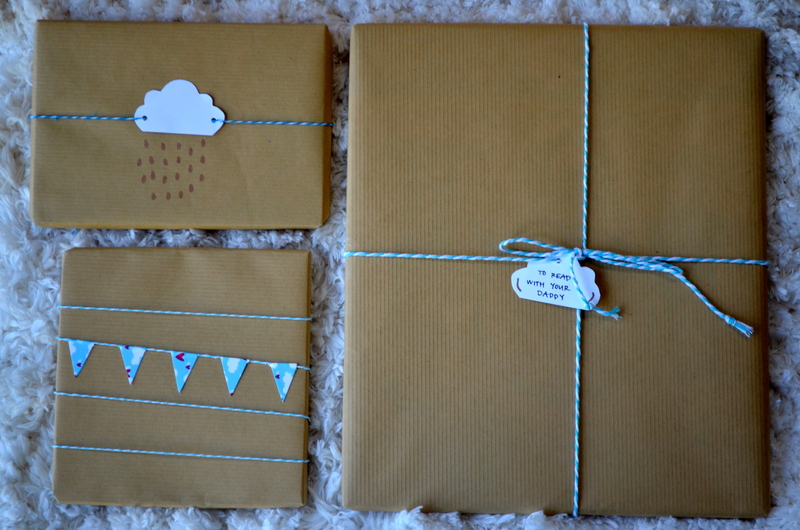 I wrapped everything in craft paper and heart and cloud washi tape! 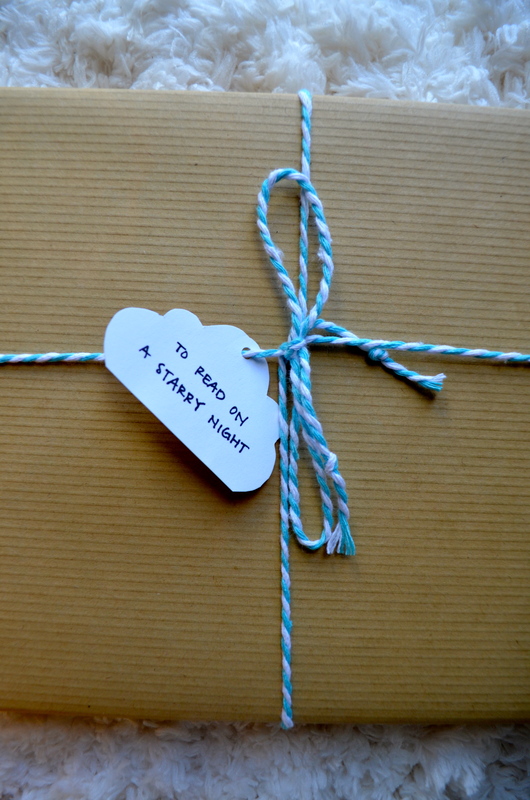 I made little cloud tags to write little messages to the baby on some of the gifts. 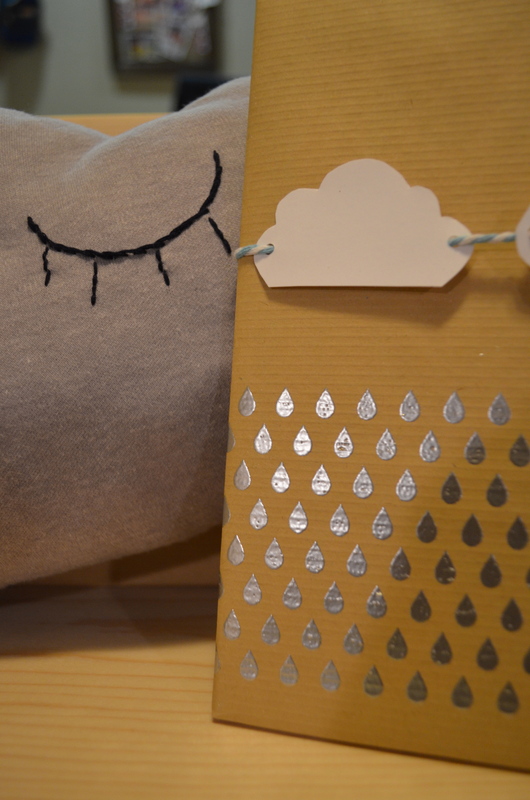 I also used my new skill of embossing to make handmade cards and wrapping paper. 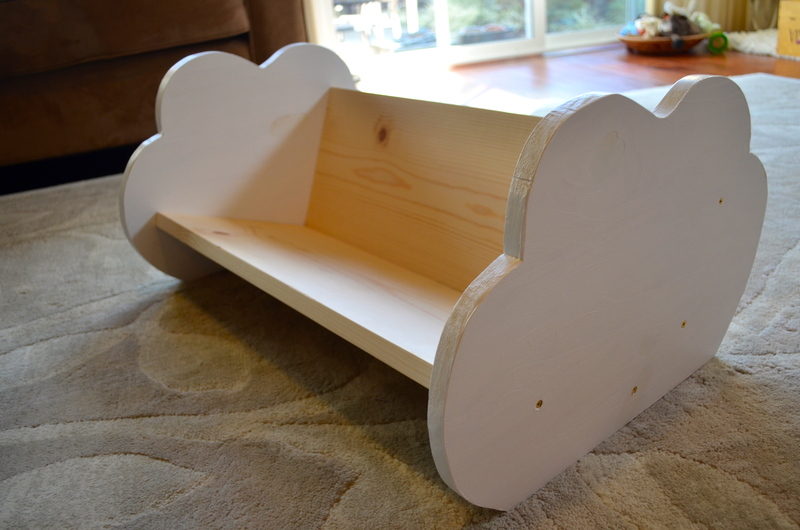 Tags: baby, cloud bookshelf, DIY, gift, woodworking | Permalink.